Onto the 2nd of today’s ERWFL Final’s the League Cup. This season being contested by Acle United Ladies and AFC Dunstable Ladies. Acle United Ladies in contention for the Premier Division title all season losing out in their penultimate game to leave them in 3rd position 3 points short of Champions Billericay Town FC. 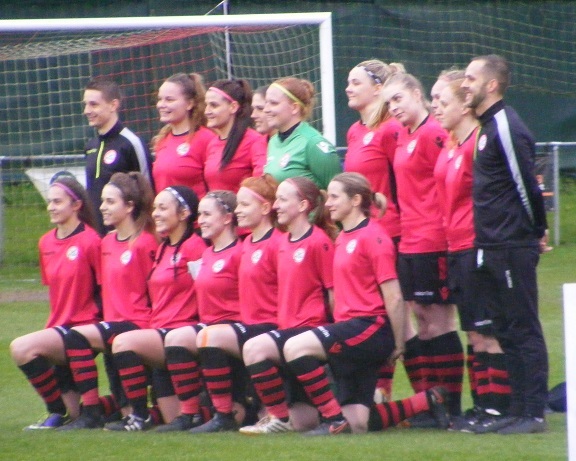 A busy spell at the end of the season games to be squeezed in a County Cup Final appearance too ending again in a close loss to Wymondham Town Ladies who will be joining them in the ERWFL Premier Division next season. Takes the shine of what has been another strong campaign one more shot at silverware though for the Norfolk side the ERWFL League Cup. Looking to stop them are Bedfordshire side AFC Dunstable Ladies finishing 6th in the ERWFL Premier Division this season haven’t matched the form of last season that saw them pushing the title challengers all the way. Have picked up some good results and one their day can beat anybody in the league. Ending their season with an opportunity to win silverware. Both sides short of a full squad coming into this afternoon’s final. Acle United losing the spine of their side with 3 players shown red in their final league game played against Cambridge City, adopting a new formation for the ERWFL Cup Final dubbed ‘The Christmas Tree’ formation. The ERWFL Premier Division sides entering the League Cup at the 3rd Round stage. Easy progress for both sides Dunstable receiving a bye into the quarter finals. Acle awarded the away win against King’s Lynn Town Ladies. Onto the quarter finals a trip to Hertfordshire for Acle to take on Royston Town Ladies a 3-1 victory sending them through the the last 4 of the competition. 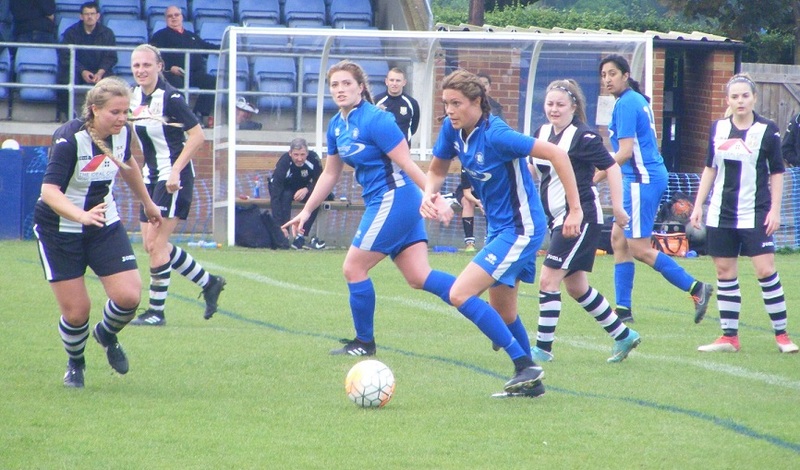 Dunstable held home advantage in their quarter final against AFC Sudbury Ladies neither side able to find a goal in regular or extra-time it went all the way to penalties Dunstable emerging the winners 6-5 in the shootout. The last 4 and both semi-finals were hard to call. Close matches too, Acle at home to eventually League Champion’s Billericay Town Ladies. Knocked them out of the League Cup with a 3-2 result. 3-2 was also the winning margin for Dunstable as they travelled to Essex to take on Brentwood Town Ladies in the semi-finals. The ERWFL Premier Division proving all season any side can beat another on it’s day. The venue of course still the same the sun out properly for the League Cup Final this afternoon. Acle United Ladies starting XI – Cyan Fullbrook, Anna Larkins, Chloe Shields, Naomi Cooper, Grace Birchall, Broghan Scully, Laura Holden, Lauren Bullard, Megan Todd (C), Kirstie Kindred & Rhianne Brister. Subs – Lauren Bailey & Rebecca Burton. AFC Dunstable Ladies starting XI – Hannah Payne, Rebecca Langthorpe, Lauren Chimes (C), Elly Wade, Steph Fisher, Rachel Moffat, Shianne Swarres, Danielle Carty, Samaira Khan, Charlotte South & Charlene Moreton. Subs – Jodie Patterson & Rianne Townsend-Brown. 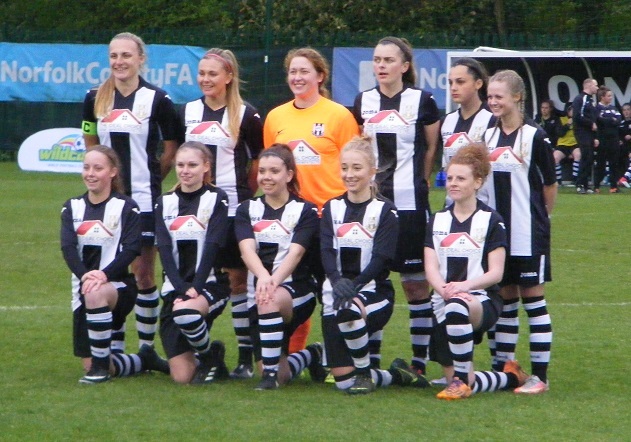 It’s Acle wearing black and white vertical striped shirts with black shorts and black and white hooped socks to get the League Cup Final underway. Dunstable opposite wearing an all blue kit. Dunstable get hold of the ball as Acle look to play it forwards Charlene Moreton playing the ball long, Samaira Khan played in behind on the right side a run down the channel into the area Cyan Fullbrook in goal for Acle comes to close her down, Khan evading her challenge takes the ball beyond her before sending a cross in along the face of goal, no one there for Dunstable, Acle get the ball clear. GOAL! A chance for Dunstable at one end it’s a goal for Acle up the other. A brilliant individual goal from Acle captain, Megan Todd the ball sent up towards her on halfway from Fullbrook’s goal kick. On the left wing Todd brings it on over halfway carrying it forwards down the wing a powerful run all the way into the box not challenged closing in on goal scoops a shot up rising past the goalkeeper in past the near post 1-0. Shianne Swarres getting hold of the ball central for Dunstable across to Rebecca Langthorpe moving forwards from right back she passes the ball on for Khan on the wing, getting in behind she fires another cross along the face of the Acle goal. Dunstable finding a few gaps in the Acle back line early on. Langthorpe with the ball on the tries to send Charlotte South away through the middle, Chloe Shields getting across to intercept for Acle. Khan with a drive towards the Acle defence in the central is clipped as the ball spins away to the left, no advantage play brought back for the free-kick in a dangerous position in front of goal just outside the D. Danielle Carty on the ball goes for goal her effort up over the crossbar. Acle giving away free-kicks, Moreton on one inside the Acle half launched up towards the top of the area, Shields under it for Acle heading clear. Dunstable pressing forwards having more of the ball. Todd the outlet for Acle as Anna Larkins wins the ball at the back up field into Laura Holding her pass on for Todd over on the right side another driving run forwards her shot fired in from outside the area with of Hannah Payne’s near post. Moreton hooks the ball forwards from inside the Acle half out to Khan on the right, Naomi Cooper defending for Acle at left back. Dunstable bring the ball on Moreton on for Khan central, Charlotte South supporting, Acle squeeze the ball at the top of their box regain possession. Rhianne Brister up front for Acle comes out to the right with the ball, support from Grace Birchall coming on past her, Dunstable captain Lauren Chimes challenging for the ball breaks up the attack. Larkins sending the ball up field from the back sets Todd up for a run in behind the Dunstable defence closing in on the box, Payne coming out towards her Todd goes to try and lob the keeper, get’s it past her Payne getting a touch on the ball however as it runs wide of her goal the corner signalled. A high ball in Todd the target far post is over her as she leaps up for it. A give and go between Todd and Lauren Bullard on the left the ball crossed into the box just behind Kirstie Kindred she recovers laying it back for Todd, her strike charged down. Acle press the ball high win a corner kick the ball defended at the near post. Acle win another corner, Dunstable can’t get it clear the delivery going long out to the left gathered by Todd she tries to get past Langthorpe the corner won. The ball played in knocked back to the taker before being sent in high towards the far post Todd up to head the ball puts it wide. Dunstable make a change Khan the player coming off on comes Rianne Townsend-Brown. Acle having a good spell starting to get hold of the ball and cause Dunstable problems Todd right squared to Kindred she sends the ball into Brister inside the box Payne makes the save as she comes charging out to met her blocking the shot. Payne comfortable as she moves across her goal to palm down Todd’s strike from distance. Holden with the pass inside to Bullard back for Broghan Scully plays it forwards onto Kindred who shoots from the top of the area Payne making a double save stopping Kindred’s strike then as Birchall heads the ball back towards goal gloves it wide for the corner. A lively contest the game played at a rapid pace. Scully over a free-kick top of the centre circle for Acle plays the ball up into the area, Payne taking the catch. Moreton coming to get hold of the ball for Dunstable plays it out to Carty on the move on the left shoots early sending the low ball racing wide of the near post. Swarres with good control in the middle playing the ball on for Carty on the left her cross into the box, South the target, Shields gets in front of her to defend for Acle. Larkins with a good tackle to stop Moreton as she comes on with the ball for Dunstable. Steph Fisher putting in the tackle on Brister as Kindred looks to put the ball into her make the run in behind. Dunstable come forwards press the ball at the back Moreton getting the ball out to Carty on the right 25 yards out goes for the shot dipping Fullbrook can’t get to it as it strikes the crossbar. Dunstable ending the 1st half well. Elly Wade across to intercept the ball as Holden plays it on for Brister to chase out on the left. Bullard getting in behind Langthorpe on the right goes on into the box Langthorpe recovering well gets back on her is fouled by the attacker inside the box. Acle with one last attack in the first half Todd on the left seeing the ball into her feet spins in behind running down the line cutting inside into the box fire a low cross along the face of goal, Chimes going to clear it smashes the ball against Kindred rushing in the ball loose Dunstable scramble it away. An entertaining first half to this season’s ERWFL League Cup Final. Acle scoring in the opening 2 minutes have held onto their 1-0 advantage both sides creating chances Dunstable striking the bar. The game far from settled yet. Changes for both sides, Lauren Bailey on at right back for Acle, Jodie Patterson on for Dunstable as well as Khan as they get the 2nd half underway. Getting a throw high up the pitch on the right. Into Moreton inside the pressuring the ball out to Khan she shoots Fullbrook dropping onto it at her near post. Todd driving forwards with the ball looks to get in on goal Wade coming back on her lunges in to take the ball away for the throw left side. Acle starting the 2nd half well the ball on for Brister she pressure Patterson into conceding the corner. An inswinging delivery Payne is on it at the near post knocking the ball down Dunstable launch clear of their box. Acle make a change Birchall off at the start of the 2nd half coming on for Brister. GOAL! Birchall involved straight away as Acle go on to double their lead early in the 2nd half. Play spread from left to right Birchall going after it picks the ball up and surges on down the right evading a challenge cutting a cross back in the ball racing across the face of the Dunstable goal, Todd arriving at the far post smashing the ball home from close range 2-0. A free-kick to Dunstable as Khan is brought down trying to bring the ball inside from the right. The ball central Carty over it goes for the shot floating the ball in towards goal it cannons off the crossbar for a 2nd time. Acle counter attack Birchall in the clear on the right takes on the early shot as she closes in on the top of the area her attempt racing wide across the six yard box out the far side. Dunstable attack on the right Khan inside the area Shields defending as Fullbrook collides with her, Khan retrieving the ball as Dunstable get players forwards in support cut back to Carty to play the shot in towards the near post Fullbrook recovering has gotten back onto position to claim the ball. GOAL! Acle extend their lead as play becomes stretched, Todd breaking over halfway on the left a strong run with the ball squares it inside for Holden top of the area left of the D, picks her spot sending her shot in low past the keeper at her near post 3-0. Townsend-Brown is played onto the ball by South coming left, Bailey with the attacker gets the challenge in Dunstable winning the corner. End to end Carty with a diagonal ball into the box from the right Shields heading away for Acle. Moreton plays the ball on into Townsend-Brown top of the area turns in behind her marker and delivers a low strike across the face of the Acle goal as the game moves into the final 20 minutes. GOAL! Acle go further into the lead taking control of the game Kindred with good work on halfway winning the ball, Todd latching onto it drives forwards, Holden ahead of her finding space Todd playing her in on goal Holden shoots from 20 yards out the ball striking the back of the net for her 2nd of the game 4-0. GOAL! Acle hammer home their advantage as Dunstable lose their shape Birchall spinning away plays the ball into Holden supporting on the right squared back to her Birchall sends a dipping shot in towards goal Payne making the save pushing the ball away lose inside the six yard box Kindred racing in on the follow up buries the shot 5-0. Acle looking strong now make a switch Holden rested, Brister back on. Dunstable go forwards South bringing it forwards put on for Moreton out to Townsend-Brown on the left sweeps a cross in early, Shields getting hold of it for Acle clears for the corner. GOAL! It’s a 6th goal for Acle Dunstable caught high up the pitch a great individual goal form Birchall. Getting onto the ball on the right as Larkins clears it up the line bursts forwards she evades Wade’s sliding challenge then shooting from the top of the area the ball races across the Dunstable goal and inside the side netting at the far post 6-0. A pause in play a player down a chance for a breather. play resumes. GOAL! Dunstable pull a goal back Moreton the scorer as she gets into the area played in by Khan attacking on the right, her initial effort stopped Moreton with a 2nd bite at the cherry lifts the ball in over the keeper to score 6-1. Townsend-Brown controlling the ball on the left cuts it back into the middle for Carty coming on, can’t quite get the ball under control before Acle recover and close her down. Bailey comes forwards for Acle, Wade tackling the ball away for a corner. Dunstable deal with the threat, try to get out Acle closing the ball down regain possession. Birchall with space on the left plays it inside for Todd 30 yards out time to line up a shot her effort bouncing wide out past the post. Birchall with the ball at her feet a great run central for Acle evading two challenges before sending a shot over the crossbar. Up the other end Dunstable strike the crossbar for the 3rd time in the game, South and Carty linking on the left the ball into Townsend-Brown positioned top of the Acle area curls a shot in towards goal sees the ball collide with the woodwork. Acle go on the attack the ball on for Brister left inside for Birchall sees Bailey clear coming in on right she strikes the ball sending it across goal past Payne a defender back on the line gets there in time to block the ball skipping up into her keepers gloves. The final whistle blows and Acle celebrate as they end their season with silverware winning the ERWFL League Cup with a 6-1 win over Dunstable. Created plenty of chances throughout the game and were clinical in front of goal. Todd getting them the early lead. Dunstable had good spells in the first half coming close the levelling the scores. A narrow advantage at half-time Acle doubled the lead early in the 2nd half and going 3-0 up two quickfire goals to make it 5-0 put them in complete control of the match. Dunstable getting a late consolation goal ended up striking the crossbar 3 times. Acle the stronger side in the 2nd half. Now for the Women’s Football East – Player of the Match. The captain led by example for Acle and scoring a fantastic solo goal early on was a handful for Dunstable to deal with all match as she moved across the front line from left to right. Adding the 2nd goal and setting up numerous chance, the award goes to Megan Todd. Congratulations to Acle United Ladies on winning the 2017/18 ERWFL League Cup. An enjoyable day spent at Letchworth watching the ERWFL Final’s. Two entertaining matches. My thanks to both sides for their help with the teams and to the ERWFL committee members for all the hard work they put into the league itself. 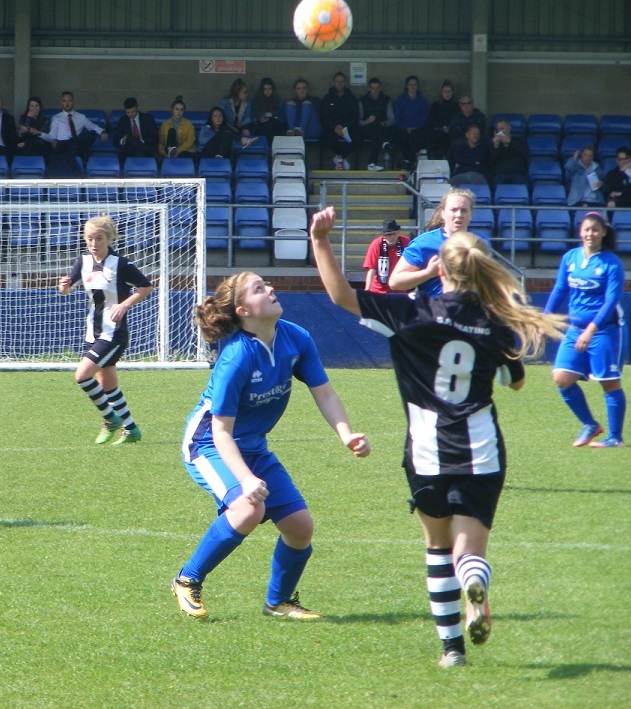 This entry was posted in Cup Final, ERWFL League Cup, Match Reports and tagged Acle United Ladies, AFC Dunstable Ladies, Cup Final, ERWFL League Cup, Match Report on May 14, 2018 by WFEast. A hot and sunny August Bank Holiday weekend, headed east along the A47 to watch a game from the ERWFL Premier Division this Sunday afternoon into its 2nd weekend a game between two sides that had opened their season scoring 5 goals apiece to claim the 3 points Acle United Ladies at home to AFC Sudbury Ladies. 12 sides contesting the ERWFL (Eastern Region Women’s Football League) Premier Division this season, Cambridge City Ladies and Colney Heath Ladies promoted from Division One. 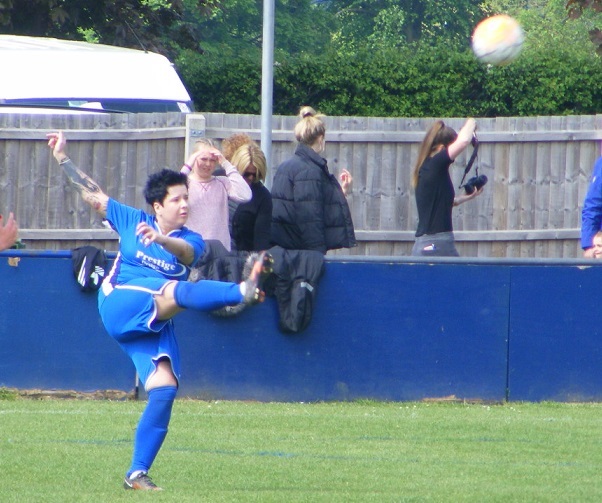 Acle United Ladies came within ONE win of winning the ERWFL Premier Division title last season and clinching promotion to the FAWPL took it to the final game of the season with a strong winning run late on to set up a winner takes all game away to Haringey Borough Women. Lost in the end Haringey Borough celebrating becoming champions going on to complete a double with the League Cup. So close Acle United begin the new season with a determination to go one better and win the Premier Division this season start as favourites although there will be a few challengers in the league. Have made several new signings over the close season bringing in Erin Wilson from Norwich City Ladies along with Ceira Flatt from Lowestoft Town Ladies. Kirstie Kindred and Olivia Mungham-Gray both join from Norfolk Division One Champions, Thorpe United Ladies. A new goalkeeper too with Cyan Fullbrook joining from North Walsham Angels Ladies. Started the season with an away trip to AFC Dunstable who pushed the top three hard last season winning the game 5-1. AFC Sudbury have established themselves in the ERWFL Premier Division, the Suffolk side having a solid campaign last season constantly in the top half pushing the top sides well before clinching 5th spot. 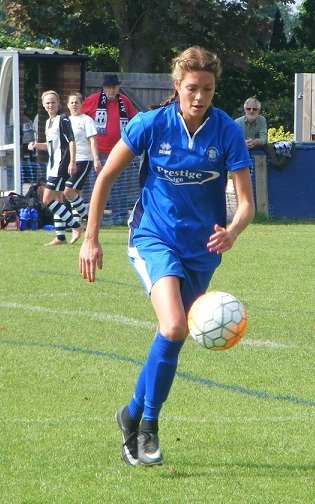 An experienced squad have retained most of last season’s players bringing in a couple of new faces, defender Laura Wheeler from Brentwood and Semma Halil who was with Silver End United Ladies. A new home ground for Acle United Ladies this season playing at the FDC (Football Development Centre) Flegg situated at Flegg High School on the outskirts of the village of Martham. Has been and still is Acle United Ladies training ground and they played a couple of cup matches there last season. 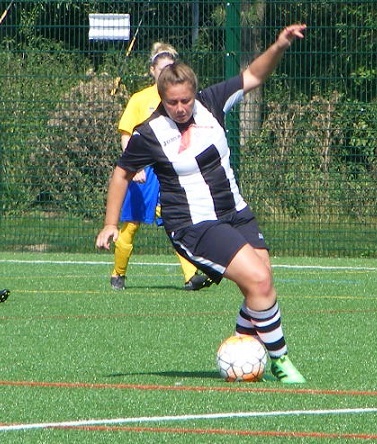 An all weather 3G pay and play facility means Acle United Ladies can play home fixtures in August and regularly throughout the season with less chance of postponements. Hot and cold drinks are available not so much room for spectators is a small pitch with coloured markings denoting various sized pitches. A beautiful day hot and sunny best enjoy them whilst they last. Acle United Ladies starting XI – Cyan Fullbrook, Anna Larkins, Erin Wilson, Kate Pasque, Chloe Shields, Broghan Scully, Amber Rowland, Ciera Flatt, Lauren Bullard, Rebecca Burton (C) & Megan Todd. Subs – Joanne Hooper & Kirstie Kindred. AFC Sudbury starting XI – Penny Everett, Holly Harrison, Rebekah Henderson, Marie Seabrook (C), Rebecca Chandler, Charley Roach, Megan Partridge, Sophie Jeffery, Semma Halil, Mia Etheridge & Stacey Teager. Subs – Laura Wheeler, Georgia Lindon, Phoebe Scott, Natalie Golding & Harriett Young. It’s Acle to get the game underway kicking off 1st half wearing black and white vertical striped shirts, black shorts and black and white hooped socks with Sudbury lined up opposite wearing yellow coloured shirts with blue across the left side of the upper chest, Blue shorts with a yellow band round the left leg and yellow socks. Acle look to put the ball long to Megan Todd moving down the right wing, Sudbury defender Rebekah Henderson wins the ball then once again as she clears and Acle regain the ball. A small pitch the midfield is congested and early on is shaping up to be a competitive battleground players on both sides quick to close the ball down Sudbury win it play the diagonal ball out to Semma Halil on the right running clear is tackled bringing 1st a throw then a corner kick. The ball goes long across the six yard box cleared Acle try to launch a counter attack the ball long for Lauren Bullard left side into the area is muscled off the ball by Rebecca Chandler. Todd is a player who likes to get forwards covers the ground quickly and will drift inside as much as stick to the wing, looks to get onto the end of a central ball flighted up towards the area into the D, Sudbury captain Marie Seabrook stands her ground coming together with Todd both grounded appeals for the foul the referee waves play on. Acle come again Erin Wilson on for Bullard on the left side getting ahead of play cuts the ball back inside the area with Ciera Flatt arriving leans into the shot sending it goalwards Sudbury goalkeeper Penny Everett dives to her right, the ball skims wide off the outside of the post. A busy start to the game injuries for both sides requiring on pitch treatment giving everyone a chance to catch their breath. Play resumes Sudbury look to attack down the left Sophie Jeffery is quickly closed down by Acle’s Anna Larkins, support from midfielder Amber Rowland the ball sent on for Todd on the right plays a long diagonal pass for Bullard trying to get into the area on the left, manages to win the home side a corner kick.An in swinging corner the ball lands in the six yard box a scramble ensues as Todd tries to latch onto it Sudbury get the ball out of the area falls straight to Acle centre back Chloe Shields takes on the shot from 25 yards out getting it on target puts the ball straight into Everett’s gloves. GOAL! A little over 15 minutes on the clock Acle have started brightly and take the lead coming forwards Todd gets in behind on the right as the ball is played through to her taking it to the byline inside the area cuts the cross back across the face of goal with pace, Everett throws herself forwards in an attempt to stop it evades her and finds Bullard timing her arrival perfectly at the far post to connect with the ball and send it into the back of the net 1-0. Todd puts the ball in the back of the net in the very next attack however it doesn’t count as it’s the wrong goal as she is slid through on goal by a beautifully weighted pass from Acle captain Rebecca Burton right side into the box Todd pulls her strike sending it wide of the near post and into one of the five a side goals stored behind the goal. GOAL! Sudbury respond well to going a goal down pushing forwards draw level as Halil wins the ball right side drives on before crossing along the top of the area for Mia Etheridge central spots Jeffery on the move up the left wing sends the ball on the winger takes the ball on challenged the ball pops in behind favourably for her to go on sends the cross into the six yard box missed by Acle at the ear post Stacey Teager is clear beyond to raise her boot and turn the ball home to equalise 1-1. Some crunching challenges out there going to be a few bruises in the morning but these two sides have met regularly over the past few seasons know what to expect from each other and are getting on with it. Megan Partridge is down for Sudbury needing treatment a drinks break is called very hot out there. Partridge is okay play resumes with 25 minutes played. Breaking up a Sudbury attack play is turned around quickly Todd running through the middle after the all has half a yard on Chandler gets a shot away from the top of the area dips late on Everett but flies narrowly over the crossbar. A free kick wide right over halfway to Acle players go up as Larkins sends it long to the far post Bullard up headers it down into the centre Burton and Seabrook challenging for the ball end up on the ground the striker getting a shot away sends the ball wide. Wilson wins the ball at left back for Acle on for Bullard left side plays the pass inside to Broghan Scully has Rowland to her right puts the ball into her moving forwards Rowland’s strike from 25 yards is blocked by Chandler. Acle regain possession out on the right with Todd the ball is sent high into the area, Everett claiming well on the bounce as the ball is attacked. GOAL! Acle double their lead as the game moves past the half hour with Jeffery looking a threat on the left side for Sudbury, Acle move in quickly to get players around her before she can break squeezed off the ball on half way by Todd, Larkins is already on the move down the wing the right back receiving the ball is a good way out around 35 yards as she whips the ball into the air sending it towards high looping towards the top corner far post has Everett backpedalling can’t get to it as it flies over her into the goal beyond 2-1. Tough tackling from Partridge after the restart sends the ball on for Etheridge central closing in on the top of the area can’t connect with the shot. Jeffery taking players on on the left wing is getting plenty of Acle attention getting a cross away the ball is claimed by Fullbrook. GOAL! Acle get up the other end with 5 minutes left of the 1st half and score a 3rd goal another great through ball from Burton with Sudbury high up the pitch Todd central is after it Everett comes rushing out of her goal sliding in looks to block Todd as she shapes to shoot does so but an unfortunate rebound off the attacker takes the ball beyond Everett, Todd stays on it and puts the ball into the empty goal beyond 3-1. Rowland goes down with n injury is substituted with Acle sending on Kirstie Kindred. A fantastic turn from Halil attacking left side Sudbury as the ball is rolling into her by Roach in behind gets past Pasque clear heads for the area, Shields gets across lunging in to win the ball take it away from Halil for the throw in. Sudbury push late on in the half Teager battling in the middle 30 yards out gets the ball through for Etheridge for a moment clear on goal Larkins does well to get across and put the challenge in. An entertaining 1st half no shortage of action a few injuries disrupting play but despite the heat the players on both sides putting plenty into the game. Acle have been on top getting in behind the Sudbury defence have had the better chances. The visitors when they can get the ball wide themselves trying to create an opening. Acle with the 2 goal cushion going into the 2nd half. A change for Sudbury at the start of the 2nd half Laura Wheeler on for Halil, the defender going in at centreback alongside Chandler, Seabrook moving forwards to bolster the midfield. The visitors the kick off the 2nd half. Straight away Sudbury are looking to get the ball have Acle pinned back in their half without making any in roads into their box. From a counter the ball is laid on for Todd right shapes to shoot early reaching the top of the area sends the strike wide. Roach and Partridge with support from Seabrook are winning the ball for Sudbury looking to carry it forwards Acle a little sluggish at the start of the 2nd half start to gather Flatt moving well finding pockets of space wanting the short pass into her. Todd peeling away right gets clear as the ball finds her running on squares the cross along the top of the area a vital interception from Chandler with Burton ready to throw herself at the ball beyond. GOAL! Despite a good start to the 2nd half from Sudbury it’s Acle who score the next goal to further extend their lead. Have possession on the right the ball carried forwards by Kindred the cross is fired in with pace into the six yard box Harrison attempts to send it clear covering the far post the ball falls straight to Burton central the striker turning the ball from the top of the six yard box into the back of the net 4-1. Todd sets up a chance for Burton moment after the restart as the ball is won back in the middle on for Todd drives at the Sudbury area before laying it on to Burton peeling away to the right inside the area pulls the trigger sends her shot up over the bar. Rowland returns to the action replacing Scully in midfield. Larkins is over a free kick inside left a long way from goal nevertheless takes on the shot puts it wide of Everett’s goal. GOAL! Sudbury pull a goal back 4 minutes after going 4-1 down. Winning a corner kick on the right is a fantastic delivery high angling in towards the far post two Acle defenders jump or it can’t reach it falls to Etheridge beyond adjusts well the get a foot on the ball leaning back and send it high into the net to make it 4-2. Sudbury come very close to making it 4-3 as the game restarts winning the ball strong from Teager to close Acle down left side wrestle possession back take the ball inside pushes it on into the path of Partridge breaking forwards 30 yards out lets fly with a venomous strike comes straight at Fullbrook the keeper reacting instinctively gloves up deflects the ball up over her head onto the crossbar it bounces once, twice on the woodwork before falling back into play pressure behind her Fullbrook is distracted watching the ball grabs it into her body saving on her goal line. Another much needed drinks break in the 2nd half. Acle bring Scully back on for Flatt in the middle. Sudbury win a corner after the game resumes left side the ball into the box Teager chests down and on the turn hits a shot the ball straight at Fullbrook well positioned in the goal beyond. Acle break quickly the ball up top for Kindred central drags her strike wide as Everett diving across smothers the ball. Wilson winning the ball left side plays a good diagonal ball long for Todd running clear on the right sends the cross inside for Scully in a central position outside the box the midfielder connects with the ball sends her shot high over the Sudbury goal. Acle make a goalkeeper change with Fullbrook coming off to be replaced by Joanne Hooper who can and has played everywhere on the pitch for Acle over the seasons. Seabrook comes off for Sudbury, Georgia Lindon comes on goes into right back with Harrison moving inside, Candler pushed into midfield. Rowland on the ball in the middle pushes on attacking the Sudbury defence sends the pass to Bullard coming inside from the left outside the area plays her shot wide of goal. An injury concern for Sudbury as Wheeler stays down after the attack her ankle strapped before the game looks to have injured it again a long break in play as she receives treatment. Gingerly gets back to her feet and is able to limp off the pitch. An enforced change Seabrook comes back on for Wheeler, Chandler too comes off Halil returning to the field. A strong run from Partridge through the midfield before playing the ball into Teager outside the box back to goal good control before getting a shot away wide of the far post. Bullard takes the ball on down the left looks to get past Lindon the defender going to ground times her challenge well conceding the corner kick from the left side the ball comes into the area a touch sends t towards goal lacks pace Everett going to ground it able to claim the ball. Jeffery in a central position breaks with the ball for Sudbury plays the pass over the top with Acle holding a high line Teager is in behind after the ball. Hooper with a good starting position inside the box is out quickly to clear the danger. GOAL! With the game stretched both sides looking to attack Acle grab a 5th goal the ball with Todd on half way she runs forwards, Scully is the player furthest forwards inside the box Todd’s diagonal pass picks her out Scully opening up her body connects with the ball sending it wide of Everett and into the goal to make it 5-2 . The injuries 2nd half have extended the game by several minutes kicking off at 3:02 the 45 minutes are up but there is quite alot of stoppage time to be played. Sudbury make a change Teager coming off up top to be replaced by Phoebe Scott. Flatt is back on for Acle replacing Bullard. Everett palms down a strike sent goalwards from Burton on the edge of the area. Hooper is a long way out of her area to kick clear as Sudbury look to counter quickly. Roach to take a free-kick wide right on halfway for Sudbury delivers the ball to the top of the area the header comes in knocked down towards goal Hooper throwing herself forwards can claim the ball. Tensions have been building throughout the 2nd half and they come to a head with Henderson shown a straight red card in the closing moments for saying something she shouldn’t have to the referee Sudbury reduced to 10. Acle attack in the final seconds the ball with Rowland outside the box takes it across the top of the area before seeing her shot blocked by Harrison the final action of the match. Another 5 goals scored by Acle as they open their campaign with 2 league wins taking maximum points with a 5-2 victory at home. Deserved winners starting well taking the lead Sudbury responded straight away before going 3-1 down at half-time as Acle got in behind their defence to score. Sudbury started brightly 2nd half before falling a further goal behind again responded well getting a goal back almost a 3rd Acle going on to wrap up the win late on. A few contenders for today’s Women’s Football East – Player of the Match some fine attacking play from Acle today moving the ball with pace have chosen their captain Rebecca Burton with some fine passing dropping deeper to receive the ball from the midfielders her forward passes setting up chances and goals along with also getting her name on the scoresheet. With two sides both scoring 5 goals in their opening league game I might have been setting myself up for a 0-0 but knowing these two sides didn’t expect anything but a committed competitive contest, plenty of energy and goals an entertaining match played in hot temperatures very enjoyable to watch. This entry was posted in ERWFL Premier Division, Match Reports and tagged Acle United Ladies, AFC Sudbury Ladies, ERWFL Premier Division, Match Report on August 27, 2017 by WFEast. A dramatic final day to the league season in the ERWFL Premier Division with the top two going head to head in a title showdown. 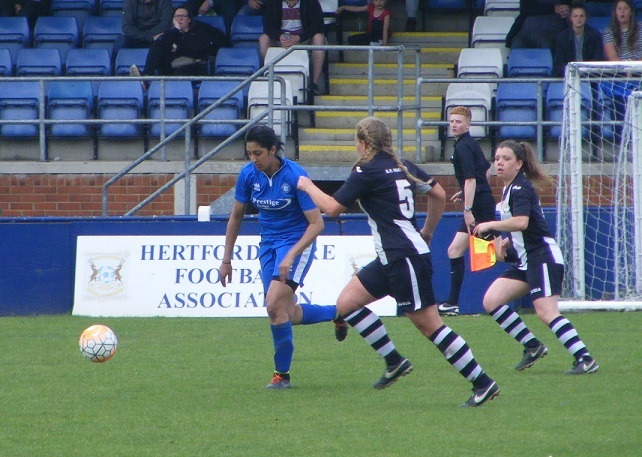 Haringey Borough Women have been in the top two all season, starting the season strongly tussling the top position between themselves and Bedford Ladies. Bedford played out their fixtures on 40 points Haringey with games in hand could catch them. So to could Acle United Ladies who with games in hand on everyone were as far down the table as 8th just 6 weeks ago a remarkable run of 8 straight wins seeing them go a point clear of Haringey going into this weekends fixture the final league match for both as Acle travelled down to play Haringey at Coles Park… winner takes all. A huge game this Sunday in the ERWFL Premier Division a final day title showdown with the top 2 meeting in their last fixture a point between them as 2nd placed Haringey Borough Women host Acle United Ladies. For both the ERWFL (Eastern Region Women’s Football League) Premier Division title would see them promoted to the FAWPL for the 1st time. 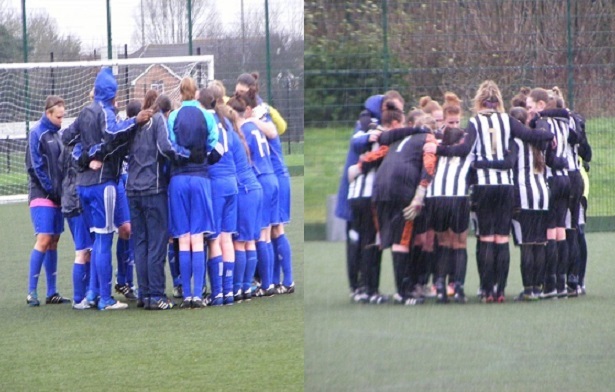 The scenario for a final day title decider has been on the cards for a few weeks and followers of my other women’s football venture Women’s Football East will have read the possibilities on the weekly Round-Up’s. As it took shape the scenario said if either side were to win all of their remaining matches then they would be crowned champions. Haringey Borough Women have been in the top two in the Premier Division, along side Bedford Ladies the two sides got off to a flyer, Haringey winning their 1st 4 opening league games, Bedford went 8 unbeaten winning 7 before Haringey ended that run. Since then the pair have shared the lead at the top of the table. When Bedford played out their fixtures ending top on 40 points, Haringey knew they could catch them with 2 games left back on 37 points winning against Histon Ladies last weekend took them top on goal difference. An established side in the ERWFL, Steve Browne took on the ladies side bringing in several new faces to rejuvenate the side, very sadly he passed away over the New Year losing his battle with cancer. The team he had left behind in very good shape vowing to go and win the league for their former manager. Only met Steve Brown once back in 2015 when I saw Haringey play for the 1st time away to Brentwood Town Ladies. Was only too happy to help me out asking about his side, he told me they were young but full of talent once they settled as a team would do well in the league. 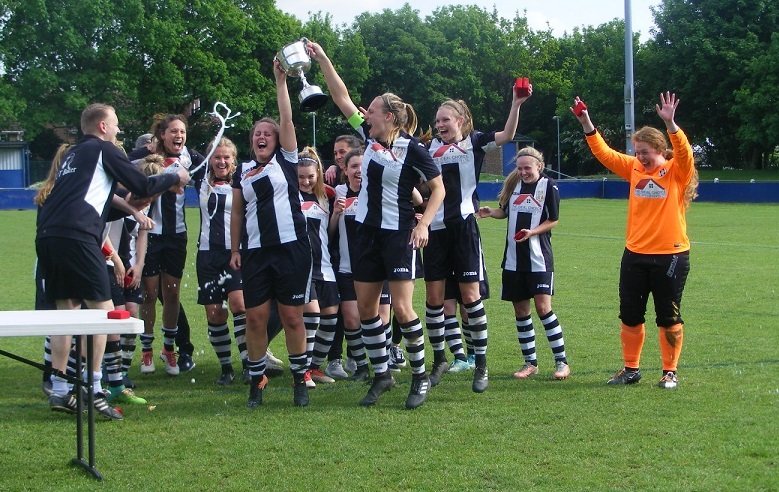 As well as a potential league title it may yet be a double having also reached the final of the League Cup where they will face Division One Champions, Cambridge City Ladies. A remarkable run from Norfolk side, Acle United Ladies at the end of the season as low as 8th place just 6 weeks ago! A good start to the season were right behind the leading pair of Bedford and Haringey, falling victim to a few postponements along with cup matches were getting behind in their league games falling down the Premier Division table as a result, in 8th place that was when as other games were played the potential title decider was on the cards. A big day for both sides. No doubt alot of excitement mixed up with alot of nerves… and that’s just me! Easy on paper have to deliver on the pitch more often than not the side with games in hand on the leaders slips up, easy to have your eyes on the game at the end of the road drop points as a result before hand. Acle United didn’t however each game won seeing them climb up the table moving into 2nd at the weekend 2 points behind Haringey, a midweek 3-1 away to Histon Ladies saw them lead the Premier Division table for the 1st time this season and Acle wanted to stay there. The venue for today’s game Coles Park home to both Haringey Borough FC aswell as the women’s side. North London parking was at a premium outside the ground the carpark inside home to a bustling market. Doesn’t clear until 2pm. Risked parking in a permit holders area but told wardens were on patrol I returned to retrieve the car quicker than the traffic warden I spotted about to cross the road. Was allowed into the ground, the market traders only to helpful to assist me find a space. Their is a clubhouse with bar and refreshment booth situated beside the stadium itself. The changing rooms under the large mainstand offered covered seating with a good view over the pitch a good sized artificial surface recently put in. A nice sunny day a few clouds but the suncream was applied with the coat left in the boot of the car. Acle United Ladies starting XI – Jody Wells, Anna Larkins, Luka Goodfield, Leah McGuire, Chloe Shields, Kate Pasque, Amber Rowland, Broghan Scully, Alice Ladbrooke, Meagan Todd & Rebecca Burton (C). subs – Jade Copeman, Bryony Knights & Lauren Bullard. A blow for Acle on the eve of the biggest game in the clubs history with Joanne Hooper, player coach, playing anywhere she’s needed most recently in goal damaging her MCL on crutches. Jody Wells normally a striker donning the gloves to today’s match. It’s the home side Haringey to kick-off the 1st half wearing yellow shirts and socks with blue trim and blue shorts. Acle lined up opposite wearing black and white vertical striped shirts, black shorts with black and white hooped socks. Acle press Haringey on the ball right from kick-off the ball closed down and won by Broghan Scully on the right side pushes on with it before playing a diagonal ball up towards the top of the area with Megan Todd making the forward run, Haringey captain, Roisin Cormack gets across the attacker puts the ball out for a throw-in on the right. From the throw level with the top of the area Scully brings the ball inside again her target is Todd inside the box rolls the ball into her striking it first time sends the ball up over the crossbar. A strong start from the visitors win a free-kick in the Haringey half as Kate Pasque is brought down as she makes a powerful run through the middle of the park. Right back Anna Larkins over the ball a couple of yards in front of the centre circle looks to send a shot in towards goal her flighted ball dipping late but doesn’t trouble Haringey goalkeeper, Cherkish Young as it flies over her crossbar. Haringey have a potent attack with strikers, Klesha Darroux and Julia Carruthers scoring 19 goals each so far this season. Darroux moves out into the left channel to receive the ball bursting forwards, Larkins gets back on her sliding in to put the ball out for a throw. Taken quickly played into Carruthers she looks to get into the box knocking the ball past Leah McGuire as she goes into challenge can’t catch up with the ball before it runs out of play. Bringing the ball forwards Acle have captain Rebecca Burton available on the left side in space 25 yards out receiving the ball she is caught with a late challenge as she releases the ball, the referee plays the advantage as Todd latches onto the ball drives into the box, cuts it back towards the top of the area, doesn’t quite reach Alice Ladbrooke having made a good run as Haringey’s Robyn Reardon throws out a leg to intercept the ball and knock it out of her path. Burton feeling the challenge is up back on her feet after treatment. Returns to the field left side just a Scully picks up the ball on halfway pushing infield passes the ball into Burton who lays it into the box for Todd making a central to left run, Young reacts smartly getting forwards to claim the ball before it can be knocked past her. Is a physical battle Haringey committing a few fouls early on giving away free-kicks. A frustrating start for the home side passes not finding their targets Acle benefiting. GOAL! Acle capitalise upon their good start to the game scoring the opening goal in the 15th minute. The build up on the right side pressuring the ball winning it back played on by Scully, Todd moving into the box that side gets to the ball first sending it across the advancing Young into the back of the net 0-1. GOAL! The lead is short-lived however as Haringey find an immediate response looking to get the ball forwards from the restart Shanice Nourrice played in on the right is fouled 30 yards out by Pasque. Brooke Hills comes forwards from the back to take the free-kick sends a high ball in towards goal, coming in near post on target a difficult on for Wells goes to palm it over, slips through her gloves and despite a desperate lunge can’t keep it out 1-1. The physical contest continues strong challenges coming in keeping the referee busy, so far letting things go. Acle press Ladbrooke 30 yards out latches onto a defensive clearance hits the ball on the half volley, Young quickly across to her left post can see the shot bounce wide. Nourrice on the attack with the ball on the right for Haringey, plays the diagonal pass forwards into Komani, collides with the onrushing Wells at the top of the box, the ball rolling into the net beyond, doesn’t stand however as the striker had moved too soon flagged offside a blow to the back for Wells needs treatment before she can continue. Ready to take the resulting free-kick for the offside Wells’ ball find Burton on the move up top 25 yards out looks to drive forwards, Hills gets back on her just as she is about to pull the trigger the ball out for a throw deep on the left. Luka Goodfield comes forwards to take gets the ball given back to her going to the byline whips a high cross into the six yard box the ball is plucked down safely by Young. Hills sends the ball into the path of Nourrice breaking down the right wing turning inside moving into the fires looks to fire the ball across the face of goal, McGuire cuts the cross out conceding the corner right side. A good delivery from the set-piece Wells does well in the middle of her six yard box gloving the ball away from a throw on the opposite side. Haringey make a change Shernelle Francois giving way for Roxanne Eshun. Cormack is late with the challenge again bringing down Todd on the left as she is put in down the line by Burton giving away the free-kick outside the corner of the box it’s Burton to take sends it long towards the far post Todd is under the ball as she goes to jump, knocked back in by the defender beyond her however Pasque inside six yards out before the post gets her head on the ball nodding it down puts it straight into the goalkeepers gloves. Acle have a player down on the far side, it’s Scully looks in a lot of pain after a challenge can’t continue is replaced by Bryony Knights who joins Todd in attack up front. Darroux seeing the ball across her body 25 yard out skips in behind evading Shields tackle as she enters the box left of goal gets a shot away as the angle closes against her a good glove on the ball from Wells diving to her right to save the ball behind for the corner kick. Haringey finish the 1st half strongly, Anele Komani getting the ball out to Gorman on the right a handball spotted by the referee gives the home side a free-kick as the winger looks to play the ball inside. Hills to put the ball into the area Pasque heads clear for Acle. Keeping the ball in the final 3rd moving it right a deflection sees Carruthers in behind into the area on the right Wells comes rushing towards her blocks the strikers shot. GOAL! Haringey push players forwards Carruthers on the ball right side is fouled by McGuire, the referee plays the advantage as Gorman has the ball goes on into the area the shot fired across goal goes long retrieved by Darroux on the opposite side she carries it towards the top of the area before turning back around and firing the ball back across goal into the bottom corner 2-1 to give Haringey the lead inside the final 5 minute of the 1st half. Haringey end the 1st half with a free-kick just outside the box on the right, Darroux to play the ball into the six yard box Wells makes the save getting her gloves on the ball palming it down then claims it as it is headed back towards her. A strong start from Acle saw them take the lead, Haringey finding an immediate response to level. Has been an open game a physical contest, and although both sides have tried using the width there’s been so much energy put into closing players down it has looked small at times. A narrow advantage to Haringey scoring late in the 1st half the game remains delicately balanced. Acle to get the 2nd half started. Haringey have Francois back on in place of Lundberg. Burton plays the ball on for Todd drifting over to the right is fouled trying to knock the ball in behind. From the wide position Burton puts the ball long towards the far post area, it’s Reardon who gets her head on the ball to clear for Haringey. Francois brings the ball forwards for Haringey through the middle before playing it up towards Darroux inside the box left of goal controls the ball well turning in behind with the keeper coming to meet her tries to lob her gets the ball over her, her effort dropping wide into the side netting. Larkins winning the ball inside the Haringey half on the right drives forwards squared the ball into the box Todd central, Cormack gets across her to win the ball. Another opportunity for Larkins to skip in behind from a throw in on the right, puts a high ball into the box this time, Cormack is there once more to head the ball away, Haringey look to counter, Pasque breaks the attack up. A high temp start to the 2nd half both sides wanting the next goal. Haringey break forwards, Komani into Carruthers goes on through the middle, Darroux moving right into the box, Carruthers picks her out taking on the shot, Darroux’s strike whistles over the crossbar. Komani is making so good runs with the ball in the 2nd half bringing the ball on committing players. Driving on looks to power her way into the area is brought down just outside left of the D. Steps up to take the resulting free-kick, gets her strike past the wall isn’t too far away as it flashes wide of the near post. Acle make a change Knights coming off for Lauren Bullard. Komani breaking forwards with the ball makes a run across the top of the Acle area looking for room to turn inside and take a shot, Pasque gets back on her to win the ball knocking it towards Larkins who sends it clear. Burton holds the ball up well shielding it 20 yards from goal turns inside finding a yard of room to strike the ball her low drive skipping off the surface is gathered cleanly by Young. Both sides are putting alot of energy into the game. Good defending from McGuire inside the box as Carruthers gets hold of the ball on the left fires her cross into the middle looking to pick out Darroux, the Acle defending getting in front of her to win the ball. Carruthers attacking with the ball right side lets fly from outside the box puts her effort into the side netting. Pasque wins the ball for Acle rolls it on for Rowland ahead of her tries to lift it over the top of the Haringey defence with Burton getting in behind, Young coming towards the ball can claim it first. Larkins pushing on more 2nd half as Acle look to equalise sends a ball into the area, Todd goes up for it with Cormack the defender putting the ball out for a corner on the left. The game moves into the least 20 minutes Haringey still with the narrow 2-1 advantage. Coming forwards for Haringey Hills wins her side a corner kick. The inswinging ball drops over Wells falling into the six yard box beyond is cleared by the Acle defence, Carruthers latches onto it 20 yards out blasts the ball back in is blocked runs back to Francois, she shoots the ball through everyone on target, Wells has started to go to her right adjusts fantastically to get her foot on the ball to save, knocking the ball wide Larkins sends it up field. A hammer blow for Acle as the game moves into the last 10 minutes, make a change Scully back on replacing Burton. Todd is clattered on the right, Larkins over the free-kick from a wide position looks to float it into the box near post for runners to attack, too close to Young the goalkeeper claims without challenge. Larkins finds herself the furthest forwards as Ladbrooke gets the ball up into the box the Acle full back getting in between Reardon and the advancing Young as they look to deal with the ball, gets a touch deflecting the ball wide, Bullard is their the ball just won’t fall for her to get a shot away before being closed down by Hills. From a throw in from a deep position on the right, Larkins works the ball inside lifts a cross in towards the near post Todd gets up for the header places the ball wide of target. Eshun comes of for Lundberg late on for Haringey. Acle needing 2 goals in the last 8 minutes push forwards risk leaving space in behind. Todd fires a low cross in along the top of the area, Ladbrooke meets it first time her strike taking a deflection on it’s way through to the goalkeeper. Pasque has a go from 25 yards out drives her shot wide across the goal. Bullard gets possession plays the ball out to Larkins on the move down the right cuts the ball back along the six yard box, Todd rushing in far post throws herself at the ball can’t connect. Komani on for Francois on the left going forwards plays the ball on for Carruthers, heading for the box, Wells comes sliding out to meet her, the striker getting the ball beyond the goalkeeper cuts it back towards the top of the box trying to pick out Darroux, Goodfield closes her down wins the tackle. Acle get the ball up into Todd, driving on through the middle, Gorman gets across to challenge her as she enters the box. Eshun returns to the action in the closing stages for Francois. Komani still has pace to burn as the game moves into the final minute getting down the left plays it on for Darroux inside the box, Wells comes sliding in does enough to put the striker off as she knocks the ball forwards but can’t catch it before it runs out of play. GOAL! The game is sealed in injury time, Wells’ goal kick falling sort goes straight to Eshun 25 yards out in a central area moves the ball to her right and with the keeper out of position places it into the back of the empty net. 4-1. A hammer blow for Acle they send everyone forwards nevertheless, Haringey defend, Cormack bringing the ball out plays it long for Carruthers arriving at the top of the box strikes the ball her powerful shot smashing against the crossbar, the last action of the match as Haringey celebrate at the final whistle. League Champions. Haringey Borough Women celebrate winning 4-1 to win the ERWFL Premier Division title coming out on top in a physical contest, played with plenty of energy a nervous start however going 1 nil down as Acle dominated the early exchanges. Pulled the scores back straight away before taking the lead themselves late in the 1st half. 2nd half Komani made alot of difference to the home sides her runs on the ball causing Acle problems as they pushed on looking to find a levelling goal conceding a penalty the late goal a making the scoreline a little harsh. Runner-up in the finish Acle United Ladies can be proud of the season they have had a great run to end the season and a highest ever league place finish. Haringey in the top 2 all season clinch the title and promotion to the FAWPL a fantastic achievement with a cup final to come. 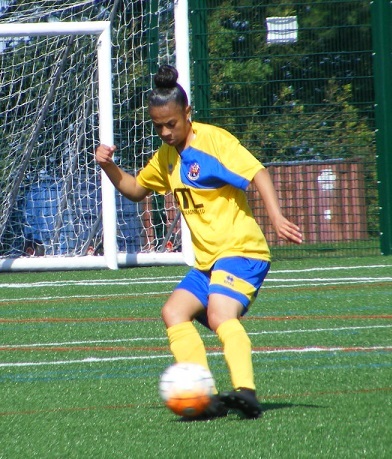 Today’s SWF Blog – Player of the Match award goes to Haringey’s Anele Komani a great midfield performance, especially in the 2nd half driving forwards on the ball looking to take on players, winning the penalty and scoring to give Haringey a valuable 2 goal cushion in the latter stages of the game. Congratulations to Haringey Borough Women on becoming ERWFL Premier Division Champions. My thanks to both clubs for all their help today have watched some great football in the ERWFL this season, a couple of cup finals left to come. 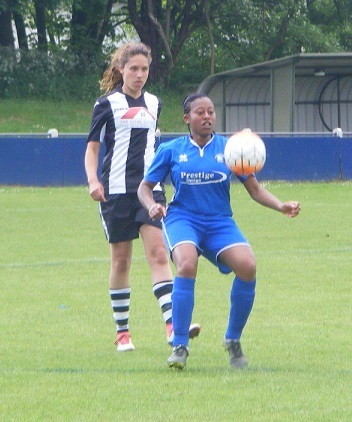 This entry was posted in ERWFL Premier Division, Match Reports and tagged Acle United Ladies, ERWFL Premier Division, Haringey Borough Women, Match Report on April 24, 2017 by WFEast. 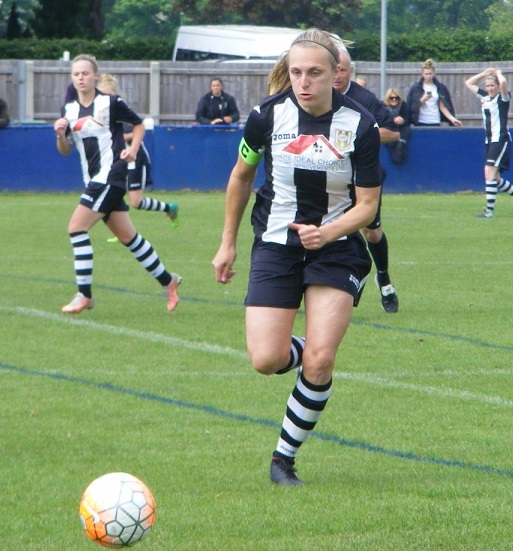 The latest match on the Supporting Women’s Football Blog comes from the semi-finals of the Norfolk Women’s County Cup. With Acle United Ladies winners of the competition 2 season’s ago hosting Wymondham Town Ladies who were looking to reach the final for the 1st time. County Cup semi-finals day in Norfolk this Sunday and the Supporting Women’s Football Blog was there to watch the game between Acle United Ladies and Wymondham Town Ladies. Both sides doing well in their respective leagues, 2 of the 3 sides in Norfolk who play their football outside of the County league set-up. Acle United Ladies well placed to mount a challenge for the title in the ERWFL Premier Division going into the latter end of the season. 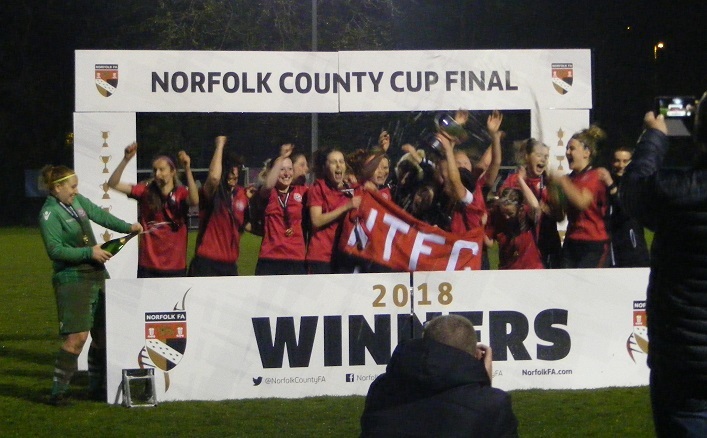 Won the Norfolk Women’s County Cup two season’s ago have beaten Norfolk Women’s Division One sides, North Walsham Angels Ladies in the 2nd Round 4-3 and King’s Lynn Town Ladies 5-3 in the quarter-finals to reach the semi-finals of this years competition. Wymondham Town Ladies play a league below in the ERWFL Division One having been promoted as Norfolk Division One Champions last season. Doing well in their debut season playing at regional level in 3rd place in the table and have reached the semi-finals of the league cup. Awarded an away win in the 2nd Round of the County Cup beat Division Two side Stalham Town Ladies 7-1 at home to reach the last 4 of the competition. Are looking to make their 1st ever final appearance in the County Cup. Seen Acle United Ladies at home several times, however this is just the 2nd time I’ve seen them play in their regular home venue at Bridgewell Lane in Acle due to weather issues. Is part of a multi-sports complex and recreation ground home of Acle United FC too. Tennis courts, bowling club and skateboard park. Headed the the large clubhouse and bar overlooking the main pitch. Had threatened to be wet and windy this afternoon and although the wind would pick up later in the game it was actually bright and sunny as the two sides walked out onto the pitch. Acle United Ladies starting XI – Joanne Hooper, Anna Larkins, Luka Goodfield, Megan Cletheroe, Leah McGuire, Kate Pasque, Chloe Shields, Amber Rowland, Lauren Bullard, Megan Todd & Rebecca Burton (C). Wymondham Town Ladies starting XI – Ashleigh O’Callaghan, Leah Newcombe, Brooke Cheal-Ferris, Bethany Fretwell, Lily Ray, Rachel Cossey (C), Amber Cantwell, Kayleigh Holloway, Gemma Sanders, Alice Collins & Laura Wiseman. subs – Laura Nicholls, Chelsea Clarke & Laura Hamilton-Rout. It’s Wymondham wearing red shirts with black trim, red shorts and red and white hooped sock to kick off the semi-final game with Acle lined up opposite wearing black and white vertical striped shirts, black shorts with black and white hooped socks. The ball is out wide early on Wymondham looking to attack down the left Kayleigh Holloway looking to take the ball on is tackled by Anna Larkins at right back for Acle, the ball played forwards up to captain Rebecca Burton is knocked out wide to Megan Todd on the right pushes inside looking to get into the Wymondham area, Brooke Cheal-Ferris makes the challenge wins the ball. Progress on the right for Wymondham the ball played forwards down the channel Gemma Sanders going after it get’s in behind the Acle defence lunging for the ball sends it in towards the middle of the six yard box with striker Laura Wiseman well placed to meet it, Larkins gets across in front of her to knock the ball wide of goal and behind for the corner kick. A good inswinging ball from the right side Acle goalkeeper, Joanne Hooper punches the ball away from under her crossbar, defender Leah McGuire clears the ball from the area. Amber Cantwell on the ball in the middle of the park for Wymondham drives forwards is fouled 35 yards from goal, picks herself up to take the free-kick players forwards from the back flights the delivery towards the far post area six yards out Bethany Fretwell goes for the header can’t get anything on the ball as it drifts out of play. A good start from Wymondham, Holloway looks to get away on the right, Kate Pasque tracks her from midfield for Acle stops the early cross, Holloway’s 2nd attempt floors defender Megan Cletheroe the ball catching her in the face, play is stopped so she can receive treatment is alright to continue. Amber Rowland plays the ball out to Lauren Bullard on the move wide left for Acle covers alot of ground before cutting inside rolling the ball into Pasque 35 yards out lines up a shot sends her effort over the crossbar. Bringing the ball on up the left for Wymondham, Holloway looks for the give and go with Wiseman coming across to receive the ball, Wiseman attempts to send the return ball into Holloway as she goes beyond the full back, Larkins reading the move intercepts and plays it up the line to Todd a powerful runner on the ball goes in field heading to the box left of the D checks back and shoots the ball straight at Wymondham goalkeeper, Ashleigh O’Callaghan who catches cleanly. Todd finds herself in a central position as Acle break up a Wymondham attack the ball played into her by Rowland she brings it on before firing it into Burton inside the D, back to goal she turns well looking to shoot the Wymondham defence close her down quickly the ball put behind for a corner kick on the left. Is a relatively open game both sides looking to attack with purpose whenever they have the ball Wiseman moving wide right to receive the ball plays it on for Sanders moving ahead of her her ball into the area going long towards the far post Holloway goes after it looks to cut back inside is dispossessed Acle look to counter attack Burton gets the ball on for Todd who takes it on into the right corner before crossing the ball back into Burton at the top of the area the striker dink the ball over the Wymondham defence, goalkeeper O’Callaghan calls for it spills the ball is Pasque bares down on her, but manages to turn and get her body between the Acle player and ball claim at the 2nd attempt. Good hold up play from Alice Collins up front for Wymondham right side as she looks to get Sanders in on the ball the winger clipped and brought down as she looks to take the ball on. Cantwell on the ball wide right lofts the ball in towards the near post Hooper isn’t challenged as she claims the ball well. Chloe Shields goes on a forwards run with the ball for Acle through the middle moving left then right into the box sending the ball on with Todd clear to her left O’Callaghan comes sliding out to get the ball as Todd throws herself forwards trying to get to it 1st knocks the ball on into the keeper and behind for the corner. Is a vicious deliver from the left flashing through the six yard box no one can connect however. Shields gives away a free-kick inside the Acle half right of the centre circle Cantwell has Cheal-Ferris free to her left rolls the ball into her takes on the shot from distance, Hooper can see the ball wide of her left post. Few strong challenges coming in but the players are getting on with it. Todd is late on Cantwell as she attacks down the left the free-kick conceded it’s Cantwell to take. The ball is played in towards the far post area six yards out both Wymondham’s Fretwell and Acle’s Pasque go up to head the ball neither getting a firm connection it drops to Wymondham’s captain Rachel Cossey gets her header on target places the ball straight into the gloves of Hooper. Rowland fighting for the ball in the middle wins it and plays the ball on for Bullard on the left drives forwards Wymondham right back Lily Ray goes with her close marking prevents the cross being made. A good contest all over the pitch the sides closely matched with 5 minutes of the 1st half left to play. GOAL! Acle break the deadlock in the County Cup semi-final a goal from back to front as Hooper kicks the ball forwards sending it up towards Bullard on the left near half way controls well bringing it on comes inside passing the ball into Todd inside the D central a fantastic 1st touch to take the ball on evade her marker behind her back to goal turns left and shoots, O’Callaghan has no time to react the ball flying past her inside the post Todd scores to give Acle the lead 1-0. Ray has taken a knock for Wymondham and needs to come off, Chelsea Clarke comes on a switch of personnel Sanders drops to right back as Holloway switches wings, Clarke over to the left side. Larkins challenges for the ball inside the Wymondham half sends the ball in towards the top of the area with Burton coming in stretches for the ball trying to bring it down under her control, doesn’t and Bullard coming in beyond her may have been better placed, hurt as she falls Burton needs treatment but is okay to play on. Into injury time in the 1st half Acle finish strongly Rowland playing the ball on for Burton through the middle slides it through into the area with Todd breaking in behind, O’Callaghan out of her six yard box quickly slides in to claim the ball. Pasque is fouled as she looks to power her way forwards. Rowland on the set-piece plays in up towards the top of the area Shields attacks the ball gets her header on target a good distance from goal O’Callaghan has time to get across behind the ball and save. A competitive semi-final in the Norfolk Women’s County Cup but expected it would be, two sides determined to reach the final. Wymondham started the game well and had the bulk of the early attacks. A fierce battle in midfield wide both sides have wanted to use their wide players but on the whole the full-backs have kept them quiet. As Acle grew into the game and Todd started to drift into more central areas the home side started to create a few opportunities of their own. Todd scoring the goal to give Acle the advantage going into the changing rooms at the break. It’s Acle to kick-off the 2nd half the sun has disappeared behind dark clouds the wind starting to pick up a little. A fast tempo to the start of the 2nd half an early free-kick for Wymondham, inside the Acle half the ball played into the area by Cantwell is claimed by Hooper. Up the other end Burton is knocked to the ground as the ball cleared by the Wymondham defence in the area catches her in the face. A pause for treatment Acle’s captain is okay to continue. Rowland presses the ball in the middle, on for Pasque out to Bullard wide left looks to pick out Burton making a move to get into the box she is closed down quickly the ball cleared for a throw. A throw in on the left inside the Wymondham half Goodfield plays the ball into Burton returning it to Goodfield the full back plays the ball up the channel with Bullard looking to get on the end of it inside the box, O’Callaghan is quickly out to the edge of her area to slide in a claim the ball. Wymondham get players forwards win a corner on the left a high ball in towards the top of the area is too high for Collins as she jumps for it over her there a cries for hand ball inside the box off Bullard as the ball comes into her bouncing in front of her she clears it the referee isn’t interested. The visitors are doing well at the start of the 2nd half Cantwell going forwards receives the ball from Wiseman holding it up back to goal outside the area, played out wide left for Holloway the winger goes forwards squaring a cross into the area headed behind for a corner. Todd defends the 1st corner for Acle a 2nd corner given away the ball is played up to the top of the area Fretwell gets her head to the ball puts her header over the bar. Cheal-Ferris has the opportunity to bring the ball forwards over the half way line for Wymondham left side is brought down the free-kick given away Cantwell is a long way from goal sends the ball in bouncing into the area, controlled by Clarke gets a shot away angling near post lacks pace Hooper is able to get down and make the save. Wymondham are pushing Acle deeper as the dark clouds return and the wind starts to pick up blowing from one goal to the other the direction the visitors are attacking. Building a attack Acle win a free-kick as Burton is caught in the face. a central position 35 yards out it’s Burton who takes the set-piece lifting the ball up into the area Todd is in behind gets her head to the ball too early however the flag is up for offside. Wymondham make their 1st change of the game bringing on Laura Nicholls for Collins with 68 minutes played. A knock for Larkins see her come off Jody Wells coming on going up front with Shields dropping deeper and McGuire moving across to full back. GOAL! Wymondham have been threatening to score an equaliser and get it in the 70th minute the attack building down the right with pace as Holloway brings the ball on squares the cross along the face of the area into Clarke far side fires in a diagonal ball towards the near post players from both sides dive in to win the ball it’s substitute Nichols who gets on the end of Clarke’s ball and turns it into the back of the net 1-1. Sanders is taken out by McGuire as she looks to drive forwards through the middle the free-kick given away 25 yards out in range for a shot Cantwell left of the D goes for the strike sends the ball wide of goal. Pasque comes forwards with the ball for Acle has Cletheroe to her right getting forwards sends the pass out to her, crosses early a high ball looping towards the near post the swirling wind sees Todd misjudge her attempted header doesn’t make clean contact with the ball falls into the box Wymondham are quickly on it to launch clear. Rowland is eased off the ball by Cossey seeing Acle have a free-kick 25 yards out in a good position. Wells to take goes for goal places her attempt over the crossbar. Wymondham go forwards the ball from Cantwell into Sanders plays the ball on for Wiseman has Nichols free to her right before she can pass the ball Cletheroe throws a leg out to tackle and win the ball. GOAL! Wymondham take the lead as Cantwell scores a 35 yard screamer to make it 2-1 as the game closes in on the final 10 minutes receives the lay off from Nichols 25 yards from goal in a central area as the ball is rolled into her Cantwell meets the ball on the run sending her strike looping in towards the top corner dipping to sail under the bar. Wymondham bring on Laura Hamilton-Rout as they look to hold onto their lead with 10 minutes of normal time left on the clock. Larkins back on for Acle, Shields gets forwards as Todd attacks on the right plays the ball into her feet outside the area goes for goals sends the ball wide across goal. Wymondham very nearly give a penalty away as Todd attacking down the left comes inside drives for the box, Sanders slides in gets the ball as Todd goes over her, the referee awarded the free-kick right on the edge of the area left of the D. Burton on the free-kick gets it up and in towards the goal, O’Callaghan is right behind it tips the ball over the bar. The corner taken from the left is fired into the area at a good pace, Sanders wins the header as it comes to her inside the six yard box. Up the other end a double save from Hooper as Wymondham bring the ball down the left Clarke sending a long ball in towards Nichols coming in far post 3 yards out looks to try and place the ball across Hooper, getting a glove to the ball the goalkeeper pushes it away from goal but straight into the path of the onrushing Wiseman lunges for the ball Hooper is down quickly to make the save. GOAL! A yellow card for Rowland as she brings down Cantwell in a dangerous area outside the box. Cantwell picks herself up and is ready to take it Hooper is setting her wall. A goal scoring opportunity have the camera pointed and ready. The referee’s whistle appears to blow a split 2nd after Cantwell strikes the ball either way the ball clears the wall and looping up flies in under the bar to give Cantwell her 2nd of the match and see Wymondham into a 3-1 in the 90th minute. GOAL! A moment later and Wymondham extend the lead have a free-kick on half-way haven’t got the camera pointed ready for this one as Fretwell stands over the ball but I should have no-one expects her to shoot the wind is in her favour the ball is sent long with plenty of pace behind it sails over Hooper and into the back of the net making it 4-1 Fretwell is buried under her joyous team mates as they know they have reached their 1st ever County Cup Final. Frustration gets the better of Rowland a rash challenge she has already been booked and a 2nd yellow from the referee sees her sent off. Plenty of stoppage time to be played Acle continue to press forwards looking to pull a goal back. Have a corner on the right goes long to Burton far post fires the ball back into the middle Todd goes for it but is closed down quickly a 2nd corner conceded on the left this time. GOAL! Plenty of players in the box for both sides as Wells sending in an excellent delivery comes in towards Pasque central inside the six yard box twists her body the send her header flying past O’Callaghan into the back of the net 4-2. Into the 8th minute of stoppage time Wymondham press forwards for one last attack the lay off running back to Hamilton-Rout 30 yards out meets the ball on the half-volley her shot racing wide of the post. That’s the last action of the game and Wymondham celebrate as they reach the County Cup Final. A good 2nd half performance from Wymondham coming back from 1-0 at half-time to win the match 4-2 plenty of late drama 2 free-kicks in the 90th minute sealing the win. Overall 2 evenly matches sides the wind stronger in the 2nd half proving both a problem and an advantage. 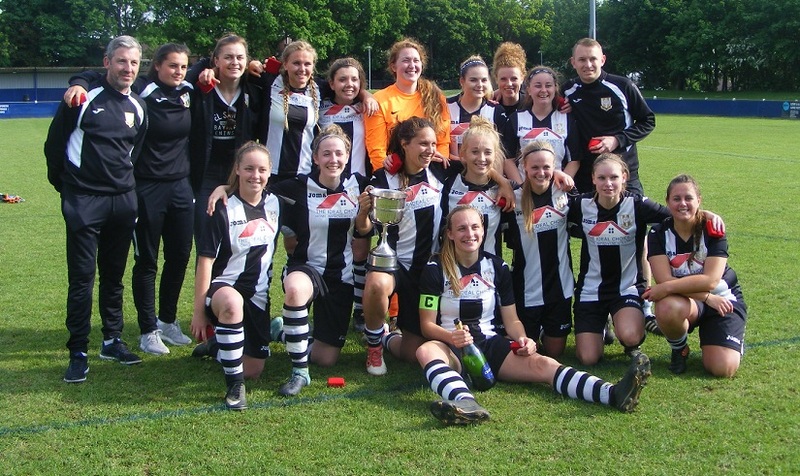 Wymondham Town Ladies opponents in the Norfolk Women’s County Cup Final will be the current holders Thorpe United Ladies after they beat Aylsham FC Ladies whom they played in last season’s final 5-0. The final scheduled to be played Friday 28th April with a 7:30pm KO. 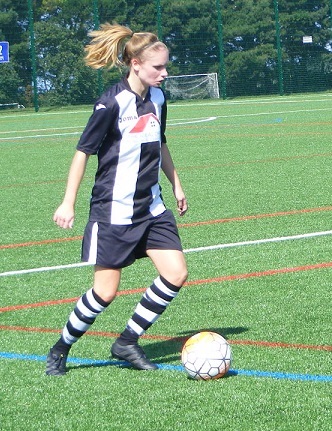 Today’s SWF Blog – Player of the Match goes to Wymondham’s Amber Cantwell a strong contender before she scored 2 goals in the last 15 minutes of the final a, competitive on the ball in the middle and a threat going forwards as well as from set-pieces. My thanks to both clubs for their help with the sides today always a pleasure to see both play. Congratulation to Wymondham Town Ladies on reaching their 1st ever Norfolk Women’s County Cup Final. The Supporting Women’s Football Blog will be there. 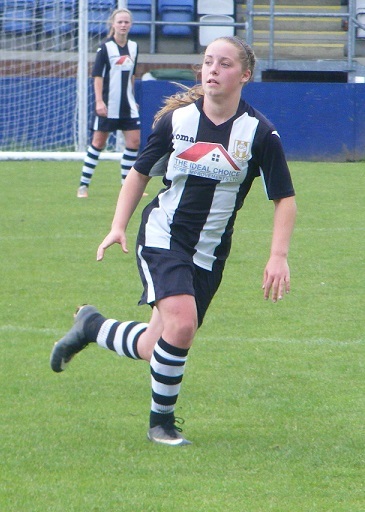 This entry was posted in Match Reports, Norfolk Women's County Cup and tagged Acle United Ladies, Match Report, Norfolk Women's County Cup, Wymondham Town Ladies on March 20, 2017 by WFEast. It was a wet one across the whole country on Sunday with a huge amount of postponements disrupting a County Cup fixtures weekend. 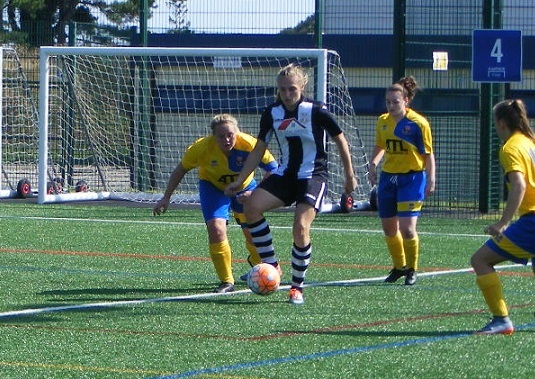 The Supporting Women’s Football Blog settled early on a 3G option, a quarter final from the Norfolk Women’s County Cup, with Acle United Ladies hosting King’s Lynn Town Ladies. Two league between the sides King’s Lynn encouraged by a bright start gave their opponents plenty to think about, lots of goals in the game read about them all in the report below. 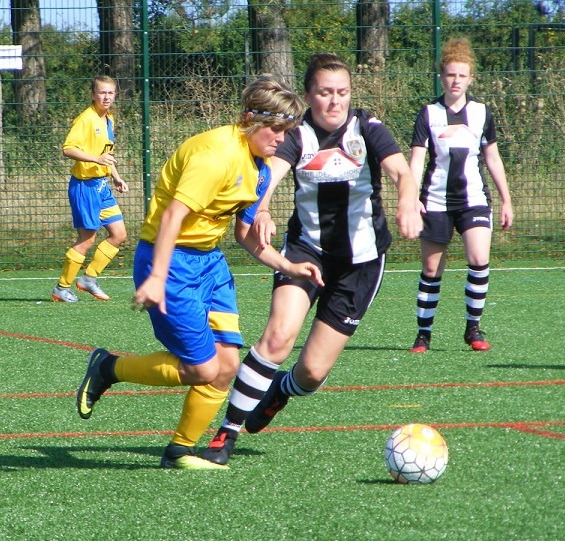 The action on the Supporting Women’s Football Blog this Sunday comes from the quarter finals of the Norfolk Women’s County Cup, with ERWFL Premier Division side, Acle United Ladies hosting King’s Lynn Town Ladies from Norfolk Women’s Division One. Acle United Ladies play their football 2 leagues higher than their opponents today in the County Cup 1 of 3 sides in Norfolk who play their football outside the county leagues. Currently 7th in the ERWFL Premier Division table have games in hand on all the sides above them. Won the Norfolk Women’s County Cup 2 seasons ago. Entered this years competition in the 2nd Round winning 4-3 away home against Norfolk Women’s Division One side, North Walsham Angels Ladies. Acle announced the signing of California State University San Bernardino scholar Megan Todd earlier in the week after obtaining international clearance, makes her debut in the County Cup. Acle United Ladies starting XI – Chloe Nixon, Anna Larkins, Luka Goodchild, Chloe Shields, Kate Pasque, Amber Rowland, Alice Ladbrooke, Bryony Knights, Megan Todd, Rebecca Burton (C) & Jody Wells. 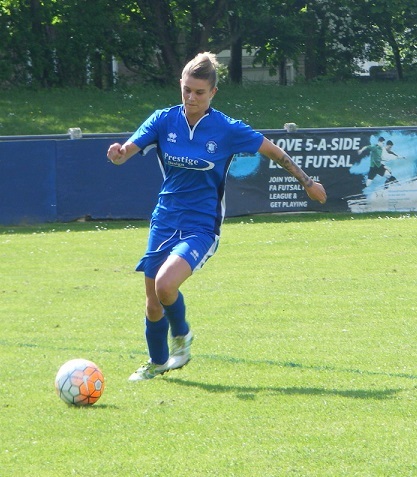 subs – Joanne Hooper, Jade Copeman & Sarah Howard. King’s Lynn Town Ladies starting XI – Christina Vivas Artacho, Winnie Lee, Lisa Wilson, Albany Hodgson, Emma Woods, Bethan Jones, Taylor Sarchet, Jade Kelly, Becky Russell, Shelley Woods (C) & Oksana Imanalijeva. It’s Acle to kick-off the 1st half, wearing red and white vertical striped shirts, white shorts and red and white hooped socks, with King’s Lynn lined up opposite wearing yellow shirts, with blue shorts and socks. The home side push players forwards at the start Alice Ladbrooke playing the ball out to Megan Todd on the right wing, drives forwards with the ball flashes a cross into the area race wide behind the goal. A lively start from both sides, Bethan Jones sliding in to win the ball in the middle plays it forwards early looking for Shelley Woods, the King’s Lynn captain looking to make a run through the middle, her 1st touch a little heavy allows the Acle defence to get back on her regain possession and sending it long, King’s Lynn goalkeeper, Christina Vivas Artacho is out of her area quickly to win the race for the ball. Starting and attack on the right full-back Winnie Lee brings the ball on playing it forwards for Becky Russell ahead of her sends the looping cross into the box, moving right side Oksana Imanalijeva brings the ball down well with her chest inside the area knocking to down right of goal shoots as she reaches the six yard box the ball is blocked at the near post as the Acle defence goes with her. Acle’s front two link up captain, Rebecca Burton, only just returned to action after a two month injury layout pressures the King’s Lynn defence, has Jody Wells in close support rolls the ball forwards for her outside the box, Wells back to goal holds the ball up before laying it back to Burton who goes for the 1st time strike sending her shot over the bar. Acle win a free-kick inside the King’s Lynn half on the right, Anna Larkins over the ball sweeps it high in towards the far post area, Todd gets up highest, getting her head on the ball can’t direct it on target. King’s Lynn get forwards on the right the cross in across the face of the area is intercepted by Chloe Shields rolled into the midfield for Amber Rowland to carry forwards, player break threads the ball into the path of Wells 30 yards out is closed down quickly by Jones still manages to get a shot away her effort flying over the crossbar. Chances for both sides early on King’s Lynn getting joy out wide play the ball out to Russell high on the right wing, fires a ball in across to top of the area, good control from Shelley Woods inside the D to kill the ball and turning hits the shot in the half-volley, arrowing for the top corner, Acle goalkeeper, Chloe Nixon produces a fantastic save a full stretch tipping the ball over the bar for a corner kick. King’s Lynn are encouraged by their bright start, pressing Acle on the ball is a competitive match, Russell with another surge up the right wing gets the corner taking it herself is an inswinging ball flies across the six yard box low no one can get a touch as it kisses the far post running wide for the goal-kick. Bryony Knights has possession of the ball on the left side for Acle, plays the ball inside for Wells she is closely marked by King’s Lynn’s Emma Woods, the ball is won by the defender played into Taylor Sarchet in the middle and on quickly for Shelley Woods in attack a good 30 yards from goal wastes no time in shooting the ball landing in the side netting. Shelley Woods reacts quickest to a poor kick out of the area from Nixon, dropping to the King’s Lynn captain 25 yards out drives on towards the top of the area moving right of goal Kate Pasque gets back on her shoulder as Nixon comes to close the angle, Woods shoots, Nixon throwing herself to the right makes the save pushing the ball wide across her area conceding the corner. Acle launch a counter attack from the corner, a strong run on the ball from Luka Goodchild from left-back sends the ball on into the area near post, Wells can’t quite reach it. Acle make a change, Joanne Hooper on in midfield replacing Rowland. Acle have another free-kick on the right inside the King’s Lynn half the ball is played into the area, Todd the target again gets up for a free header, a tall player knocks the ball down into the ground inside the six yard box is straight at the goalkeeper, Vivas Artacho dropping to the floor and making the save. Both sides are pressing looking for the opening goal, Acle over load the right side win a throw taken quickly into Wells turns inside towards the box moving across the face of the area is fouled as she cuts the ball into the area for Burton, no advantage play is brought back for the free-kick 20 yards out right of goal, Wells to take it goes for goal sends the ball over the bar. Albany Hodgson does well at the back closing down Knights as she is playing in moving in field from the left getting into the area Hodgson slides in to take the ball away from her out for a corner kick, Played in from the right, Todd in a central position outside the six yard box is allowed another free header, drops the ball wide trying to direct it into the bottom corner. More attacking play from Acle down the left Ladbrooke sending Knights in down the left swings the ball in across the six yard box, Vivas Artacho gets down but spills the ball out into the middle of the box, Emma Woods gets their before the Acle attackers the ball is cleared long out to the left side, picked up by Imanalijeva the striker takes it up the wing has Jade Kelly on that side with her lose sight of both as the crowd get excited, a shot comes blazing in however from distance, Nixon throwing herself to her right can’t get to it the ball past her cannons off the post and deflects behind for a goal-kick. GOAL! A blow for King’s Lynn after matching Acle competitively for nearly half an hour find themselves 2-0 down just a minute after conceding, Acle get forwards down the right Larkins linking up Todd, a corner is won. The ball is fired in along the six yard box, comes straight at Pasque central, at head height a difficult ball to deal with, can’t jump no time to stoop either makes good contact with her forehead turning the ball towards goal and into the back of the net 2-0. King’s Lynn look for a response Sarchet getting the ball up to Shelley Woods moving out to the right turns towards the area holding it up before playing it back to Russell moving towards the right corner of the box, shoots her low drive held by Nixon at her near post. Acle attack down the right the ball played inside is helped on towards Burton who is fouled right on the edge of the area a shove in the back is OK after treatment, Larkins over the ball right of goal, Wells is free unmarked 20 yards out in a central position Larkins rolls the ball into her path fires the ball into the area too many bodies to squeeze through the shot is blocked. Shelley Woods and Imanalijeva combine up front for King’s Lynn the ball with Woods on the right turns inside reaching the area lays it across the face for Imanalijeva inside the D, digs the ball out from under her feet sending a rising shot goalwards, Nixon palms the ball down and gathers cleanly. Another chance for Imanalijeva moments later as Emma Woods breaks up an Acle attack gets the ball up field to Shelley Woods passes it out to Imanalijeva left side outside the area meets the ball 1st time slicing her shot away from goal. A throw for King’s Lynn on the left inside the Acle half Kelly into Imanalijeva heads the ball on towards the far post Shelley Woods coming onto it as it arrives in the six yard box fires the ball wide across the face of goal. Picking up the ball in half way Burton carries it forwards picking out Todd on the right, holding the ball up looks to spin in behind get into the area, Emma Woods goes with her gets a foot on the ball to push it on for Vivas Artacho to launch out of the area. GOAL! Into the last 5 minutes of the 2nd half, Burton with another run from half way has Larkins bursting forwards on the right getting ahead of her rolls the ball into her path taking in on down the wing squares a fierce cross in across the six yard box, Vivas Artacho throwing herself forwards can’t quite reach it, nor can Hodgson tracking back, somehow Wells gets in between them and pushes the ball over the line to make it 3-0. GOAL! Acle continue to attack late on in the 1st half, are hit on the break as Lisa Wilson wins the ball back plays in infield the ball on through the middle finds the attackers Shelley Woods and Imanalijeva next to each other in a central position 25 yards from goal, it’s Imanalijeva who spins inside with the ball, a surging run into the area reaching the top of the six yard box fires her shot past Nixon to pull a goal back for King’s Lynn 3-1. An action paced 1st half Acle United Ladies leading the quarter final 3-1 at the break as the rain starts to slow and eventually stop. A competitive battle King’s Lynn encouraged by a positive start had chances to take the lead, Acle prepared to push bodies on at timely intervals getting into a quick-fire 2-0 lead, more chances followed, Acle going on to score a 3rd goal, that scoreline harsh on King’s Lynn going into half-time they pulled a goal back before the whistle to keep the deficit down to 2 goals. It’s King’s Lynn to kick-off the 2nd half. A change for Acle at the break, Burton off, Hooper moving up front with Rowland back on in midfield. Sarchet closes the ball down quickly in midfield for King’s Lynn played the ball backwards for Emma Woods who sends it long over the top with Shelley Woods breaking in behind the Acle defence, Nixon quick quickly off her line to come sliding in and smothers the ball on the edge of the area. Shields with a good tackle deals with a high ball put in from the right for Acle. An early switch 2nd half for King’s Lynn with Kelly the player substituted, Natalie Bunton coming on, is involved in the action straight away as Sarchet bringing the ball on through the middle releases her on the right wing, takes on the early shot outside the area the strike off target. The 2nd half has started in a similar tempo to the 1st half, both sides looking to attack, Acle’s Wells has the ball on the left 25 yards from the King’s Lynn goal opens up her body as she shoots sending a curling ball wide of the far post. A good turn in the ball by Shelley Woods as the ball is played into her 25 yards out back to goal, escaping her marker lays the ball forwards for Russell on the left, taking the ball to the by-line is tackled by Shields the throw leading to a corner kick, swung in from the left towards the top of the area, won by Ladbrooke the ball is cleared, King’s Lynn regain possession come forwards the ball played into the box claimed by Nixon. Acle press players forwards, Larkins going past Todd as the ball is held up by Hooper outside the area rolls it towards the on coming full-back shots the ball flying straight into Vivas Artacho’s gloves the keeper positioned in the centre of her goal. Sarchet gets forwards for King’s Lynn as Shelley Woods has the ball out on the right for plays it across the face of the area, meeting it Sarchet fires a shot in across the keeper, diving full stretch to her right, Nixon makes the save pushing the ball wide of her goal. Larkins nips in to win the ball on the right inside the King’s Lynn half fires it into Wells holding position outside the area right of the D, Hodgson gets a toe on the ball to stop her turning in behind, Wells gets back on the ball pushed wide lifts a cross towards the far post Todd coming in puts her shot wide of goal. GOAL! Play held up for 4-5 minutes it’s Acle who take advantage going on the attack the ball played up to right Todd on for Larkins taking the ball into the corner sends the cross long across the six yard box, Wells is their the ball behind her, thinks about the overhead kick, however Knights is right behind her, meets the ball 1st time sending it under the diving goalkeeper 4-1 extending Acle’s lead with around 25 minutes left to play. GOAL! As in the 1st half one goal is quickly followed by another however it isn’t Acle who extend their lead further. The ball is with Shelley Woods receiving it from a throw on the right side is inside the area, right corner shoved over the referee pointing to the spot, it’s Woods herself to take it Nixon guesses right dives to her right but the ball is placed perfectly by Woods into the bottom corner of the net 4-2. A rush of blood moments later from Nixon as the Acle keeper comes rushing out of her area as King’s Lynn, Shelley Woods is played in behind, gets to the ball 1st taking it past the stranded keeper on towards the edge of the box, Larkins gets back just in tome to stop Woods taking an early shot into an empty net, by the time the striker manoeuvres herself into a position to shoot her strike is cut out by Pasque and the threat cleared. King’s Lynn bring Kelly back on replacing Bunton. Nixon hasn’t been put off coming out for the ball the save is needed as Shelley Woods sends Kelly through on the right, the keeper coming outside the box making it the ball before Kelly can push it past her. A change of formation for King’s Lynn as they look to try and pull a goal back, Wilson off at right back, Bunton back on to join the attack as they go 3-4-3 as the game moves into the final 15 minutes. Rowland takes the ball forwards for Acle playing the pass out to Todd on the right, 30 yards from goal is given time and space to line up a shot, whips the ball in towards goal, isn’t too far over the cross bar. Knights with a strong run on the left wing gets a corner for Acle the ball is playing into the middle, Pasque jumping highest heads the ball down into the ground right in front of Vivas Artacho the goalkeeper down quickly getting hold of the ball. A minute later up the other end Pasque head the ball clear of her area as Hodgson lifts in a free-kick from halfway. Corbyn wins a 50/50 ball on the right plays it down the line for Bunton ahead of her travelling with the ball getting into the box on the right tries to cut the ball back into the six yard box from the by-line, Nixon has come the ball under her feet adjusted well to stab the ball away. Acle have a throw on the left, played in field into Rowland she attempts to lift the ball over the top for Todd breaking into the area, coming forwards Vivas Artacho get’s her gloves around it 1st. Into the last 10 minutes and Acle are looking for a 5th goal. The ball is played into Wells 20 yards out, tries to turn, Emma Woods wins the tackle the the foul for King’s Lynn. GOAL! No let up in the energy both sides keeping up a good tempo, Acle have possession with Rowland in the middle a good move sees her play the ball up to Wells outside the box on the right side this time, holding the ball up has support from Todd lays the ball back to her, Todd with a burst of pace drives into the box goes to shoot is brought down by Jones the penalty kick awarded. It’s Todd herself to take it, hits the ball low and hard to the keepers right beyond Vivas Artacho’s outstretched gloves into the bottom corner 5-2 with just a couple of minutes of normal time left on the clock. GOAL! Again King’s Lynn respond with a goal, after a 20 strike from Imanalijeva is held by Nixon before King’s Lynn win the ball from the kick out is played over the top Shelley Woods beating the offside trap and Nixon as the Acle goalkeeper comes out to close her down taking the ball to the left of goal, turns and lifts her shot over the defenders racing back to drop into the net beyond, 5-3. Into injury time Acle make a double switch, Jade Copeman and Sarah Howard on for Goodchild and Ladbrooke. A late chance for Acle who have the ball on the left getting a throw the ball is played into Knights fires a diagonal ball in across the face of the King’s Lynn goal, throwing herself at it far post Howard can’t get anything on the ball to deflect it goalwards. A 5-3 win for Acle United sees them through to the semi-finals of the Norfolk Women’s County Cup, a highly entertaining match plenty to cover, both sides playing their part in a competitive performance, both intent on attacking throughout the 90 minutes. King’s Lynn can take alot away from the match a good test for their side that continues to improve. Acle with some good attacking play getting players forwards will fancy their chances in the semi-finals, where they will be joined by Wymondham Town Ladies who beat Stalham Town Ladies 7-1 and last seasons beaten finalists Aylsham FC Ladies who beat Briston Wanderers Ladies 3-2 away from home the winning goal coming in the last 30 seconds. Holders Thorpe United Ladies will be away to Bohemians Ladies next Sunday. A tough one this Sunday with so many players putting alot of effort into 2 good team performances, but with her 2 goals on debut I’ve chosen Megan Todd, her pace and power on the ball adding a new dimension to the Acle United Ladies side. A great cup tie, entertaining plenty of goals and the rain even stopped. My thanks to both sides for their help with the team and sending my best wishes to King’s Lynn Town Ladies, Taylor Sarchet hope she isn’t too badly injured and makes a speedy recovery. This entry was posted in Match Reports, Norfolk Women's County Cup, SWF Blog and tagged Acle United Ladies, Kings Lynn Town Ladies, Match Report, Norfolk Women's County Cup on January 17, 2017 by WFEast. 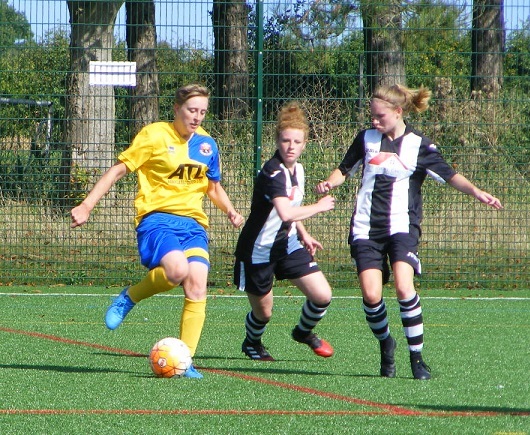 The women’s football action at the weekend came from the ERWFL Premier Division on the Supporting Women’s Football Blog a trip to the Wardale Williams Stadium to watch AFC Sudbury Ladies play Acle United Ladies. 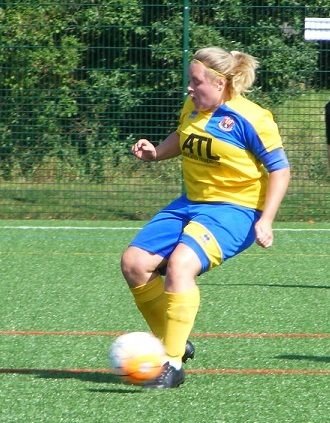 The women’s football action on the Supporting Women’s Football Blog this Sunday comes from the Eastern Region Women’s Football League (ERWFL) Premier Division a trip to Suffolk to watch AFC Sudbury Ladies play Acle United Ladies. The ERWFL season kicked off last Sunday and both sides got off to a great start recording opening day wins. Suffolk side, AFC Sudbury Ladies enter their 2nd season playing in the ERWFL Premier Division finished 3rd in their debut season at this level a position they held for most of the campaign. Will be hoping to push on challenge for the top 2 this time around have added to their squad bringing in Penny Everett and Megan Partridge who were with the now folded Long Melford Ladies last season. 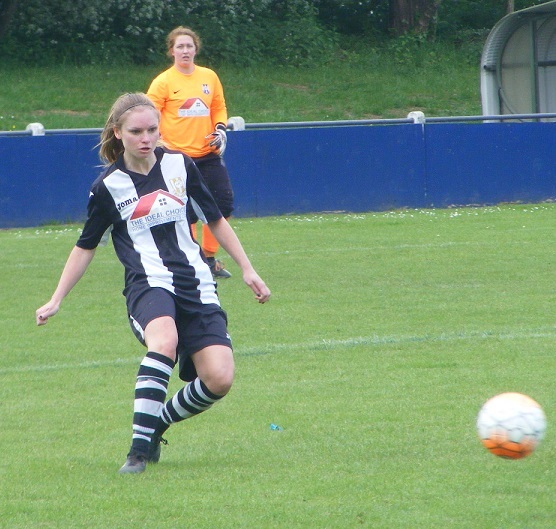 Started the season with an opening day victory at home, Sasha Diston scoring the goal as Sudbury beat newly promoted Royston Town Ladies 1-0. 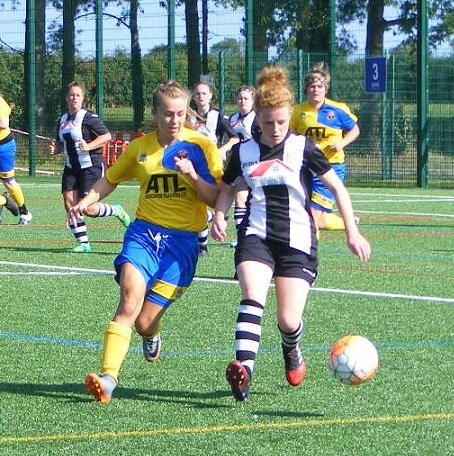 Acle United Ladies are beginning their 3rd season playing in the ERWFL Premier Division and the side from Norfolk having been at the wrong end of the table for the past two seasons are confident of better things this time around. The club has seen a change of coach and several new players joining the club during last seasons campaign coupled with fixture pile up due to early season postponements that never let the club gain any momentum on the field. The close season has seen a few more additions to the squad which got the season off to a great start last weekend winning 5-2 on the road against AFC Dunstable Ladies. Although AFC Sudbury Ladies have featured in match reports on the SWF Blog before this is the 1st time I’ve seen them play at home. Are very much an integral part of the men’s club, play at the Wardale Williams Stadium on the outskirts of Sudbury. A state of the art 3G pitch with a large newly built clubhouse and stand on one side of the ground, refreshments hot and cold available. A covered terraced stand between the dugouts on the opposite side of the pitch with covered standing areas behind both goals. Still warm and sunny as we near the end of August, several dark clouds around with the chance of a heavy shower during the match. AFC Sudbury Ladies starting XI – Penny Everett, Holly Harrison, Charlotte Churchman, Rebecca Thrower, Sasha Diston (C), Phoebe Guiver, Hayley Turner, Charlene Roach, Sophie Jeffery, Mia Etheridge & Megan Partridge. Acle United Ladies starting XI – Joanne Hooper, Anna Larkins, Luka Goodchild, Chloe Shields, Kate Pasque, Alice Ladbrooke, Amber Rowland, Rose Glendinning, Shannon Dade, Rebecca Burton (C) & Jody Wells. Sudbury kick off the 1st half wearing yellow shirts and socks with blue shorts were without a few 1st team regulars unavailable for the game. Joanne Hooper, Acle’s player/assistant coach can and has played in a number of positions for the side, today was in between the sticks keeping goal. Acle were wearing their new away kit red and white vertical striped shirts, white shorts with red and white hooped socks. Straight from the kick off, Sudbury play the ball up the right channel with Hayley Turner giving chase to the ball, Acle’s, Chloe Shields comes across to tackle and win the ball on the edge of the box putting the ball out for a throw. Receiving the ball from the throw in, Sudbury’s Holly Harrison sweeps a high ball up into the Acle six yard box, Hooper sees it safely into her gloves. Playing the ball out quickly from the back, Anna Larkins on the right passes the ball on for Shannon Dade ahead of her attacking down the wing takes on the shot as she reaches to top of the box, hits the ball hard and low towards the near post, Penny Everett in goal for Sudbury has the angle covered, gathers the ball into her body. Early pressure from the visiting side, winning the ball at the back get it up top through the middle quickly, Alice Ladbrooke playing the ball into striker, Jody Wells feet, back to goal 25 yards out looks to flick it over the top of the Sudbury defence with Dade making a run in behind to the right, Everett has seen the threat and coming off her line early clears the ball as it enters the area. Acle regain the ball and coming forwards win a free kick 30 yards from goal, Amber Rowland over the ball sends it long into the box towards the far post. Rebecca Thrower defending for Sudbury does well to stop Acle midfielder, Rose Glendinning get in round behind her concedes the corner. The set-piece goes long beyond the far post Ladbrooke gets up to head the ball, turns her effort behind for a goal kick. An end to end start to the game both sides looking to break quickly on the counter attack, Glendinning carries the ball with her through the middle of the park looks to put, Rebecca Burton the Acle captain through on goal, a good run, Sudbury’s Charlotte Churchman gets across her path just in time to push the ball wide and clear. Sudbury attack up the left side of the pitch the ball played into Sophie Jeffery her diagonal pass through the middle almost has Turner clear to attack the Acle goal, with Hooper rushing out it’s Kate Pasque who nips in ahead of Turner to intercept. Phoebe Guiver comes on for Sudbury. There are a few fouls being committed both sides getting a little physical, Sudbury in particular not happy with some of the refereeing decisions. Free kicks being given away, Sudbury are awarded one in the middle of the Acle half a chance for Charlene Roach to test out Hooper in goal gets the shot on target but not enough height to trouble the keeper. Another free kick to Sudbury on the left top of the area is played in towards the far post plenty of bodies there to attack it, it’s an Acle head that gets it cleared out of the box. GOAL! 22 minutes played and the visitors take the lead. With possession on the right bringing the ball into the Sudbury half, Acle win a throw in the ball is put into Glendinning who plays a great ball forwards for Wells to turn onto and run at the Sudbury box, Everett comes racing out to slide in at the strikers feet, spills the ball escaping her rolling to the right, Wells having kept her feet goes after it and turns the ball into the empty net beyond 0-1. Sudbury are awarded another free kick inside the Acle half with no advantage coming as they press bodies forwards. To the right of the box 30 yards out defenders come up from the back as Roach plays the ball diagonally to the far post, Acle head the initial ball clear out to the left Sudbury close it down and regain possession an early cross into the box, Diston is still forwards in the area connects with her head 12 yards out places the ball wide of the near post. Sudbury continue to put the Acle back line under pressure keeping possession around their 18 yard box, Megan Partridge unable to find a way through with the ball left side plays it across to the right with Harrison having gotten forwards looking to hit it 1st time, can’t keep her strike down. GOAL! Acle are attacking down the right the ball is flung into the area, Thrower gets across Wells to clear the ball, Ladbrooke reacts sharply coming forwards to intercept the ball fired into the box, Wells turns the ball across the six yard box an awkward ball for the defence to deal with facing their own goal, Everett comes for it with Burton closing her down doesn’t gather cleanly as Burton challenges and manages to turn the ball over the line 0-2. Dade bringing the ball on down the right wing for Acle takes on the early shot, angling in low towards the near post, Everett is across and in place to make the save. The foul count is clocking up against Rowland as she gets a final warning from the referee. Hooper commits early to coming out to the edge of her area sliding in to claim the ball as Partridge tries to play Turner in over the top. A free kick for Acle inside the Sudbury half Larkins plays the ball long to the far post from the right, Everett jumping up amongst the players around her to lay claim to the ball. Acle make a change Leah McGuire coming on for Rowland. Mia Etheridge steals in to win the ball off the Acle defence and run in behind down the right squares a good ball along the six yard box, no one attacking the near post, Hooper is able to throw herself forwards and get hold of the ball. Time running out 1st half to get themselves back into the match Partridge is flagged offside in the Acle box as she squeezes a shot past the on rushing Hooper. Luka Goodchild is left hurt on the floor as she loses the ball inside the Sudbury half, Etheridge dispossessing her races forwards down the right wing, Pasque covers the ground to get across to challenge plays the ball out for the corner kick. GOAL! Little time left to play in the 1st half the corner on the right is sent long towards the far post area goes over everyone, the referee blows his whistle and points to the penalty spot having spotted a push. Acle protest and Pasque gets yellow carded for dissent. Up steps Roach to take the penalty kick for Sudbury, puts plenty of power behind the ball Hooper guesses right, diving to her left the ball is wide of her and nestles into the corner of the goal 1-2. A goal right on the stroke of half-time has gotten Sudbury back into the game having gone 2-0 down. Acle having the better of the attacking play for a good percentage of the half going ahead midway through the 1st half then doubling their lead looking comfortable at the back until conceding the late penalty, Sudbury haven’t been at their best the goal back giving them a much needed lift. Acle to get the 2nd half under way as Sudbury start the 2nd half with striker Stacey Teager who scored 16 goals last season on the pitch replacing Turner. Georgia Lindon is also on for Jeffery. McGuire has dropped into the defence for Acle with Pasque taking on a midfield role. Sudbury look to get Teager in on the action right from the start winning the ball the pass is played out to her making a run to the right of the box, Shields comes across and tackles well inside the box to win the ball. Goodchild carries the ball out from the back for Acle on the left plays the pass up to Ladbrooke her crossfield pass looks to pick out Dade breaking forwards down the right trying to get into the box, Churchman staying on her shoulder puts in a well timed tackle to win the ball her clearance from the back is intercepted by Acle, Larkins having come forwards on the right to offer support for Dade takes the ball down the line sends a low cross racing along the top of the six yard box, Everett gets down quickly to smother the ball before it can reach Burton at the far post. Everett is well placed in her goal with Acle counter attacking the ball up the left is lifted up into the middle with Wells running into the area right of goal strikes the ball 1st time angling it in towards goal, Everett makes the save confidently taking the ball into her body. A busy spell for the Sudbury keeper with Acle stretching play, Dade finding space to run into on the right her cross is towards the near post, Everett is 1st to the ball. Burton controls a long pass sent up through the middle 20 yards out back to goal lays it back into the path of Wells, running onto the ball looks to curl her shot back in is straight into Everett’s gloves. GOAL! Having been under a little pressure at the start of the 2nd half Sudbury get themselves back on level terms. Attacking the ball is lifted up into the Acle area, Teager goes after it as the ball runs to the byline on the left, has support from Guiver lays the ball back to her, is clipped just outside the box, staying on her feet gets inside sees her shot blocked at close range, the referee blows up and awards the home side the free kick outside the area. Roach is over the set piece goes for goal getting plenty of lift on the ball on target drops late an awkward one for Hooper to try and deal with on her line, can’t keep it out and Sudbury equalise2-2 Roach with her 2nd of the match. Acle have good possession of the ball on the right, Larkins able to support Dade on the wing, both get the opportunity to cross into the box, both times the ball is sent in near post with Everett 1st to the ball. Sudbury are getting some joy out wide themselves as the game starts to get stretched players tiring, Etheridge is played in on the wing running with the ball into space fires a low cross into the box with Partridge making a run into the area connecting with the ball sends her shot wide across goal. Etheridge runs onto the ball put out to the right again and taking it forwards lifts her cross up into the six yard box with Teager attacking the near post, lifting her leg can’t quite bring the ball down for a shot but improvises well preventing the defender behind her heading it clear hooks it over her with the outside of her boot looping up is straight into Hooper who catches the ball. Pressing forwards with the ball Glendinning has Ladbrooke ahead of her in front of the Sudbury box links up with Larkins and Dade the trio in front of the D, crosses to Dade right with Larkins in between the pair, giving Larkins the ball she looks to pass back to Ladbrooke goes for the shot is blocked at close quarters by Diston the rebound back with Larkins she takes it on into the area, Thrower gets back on her to put in the challenge as Larkins shoots pulls the ball wide across the goal face. Pasque is off for Acle with Rowland returning to the action. GOAL! Wells sees a shot blocked the ball spinning behind for a corner kick on the right. It’s Wells to take the set-piece the delivery long to the far post. A Sudbury head gets the ball away sent high up towards the edge of the area dropping, is an awkward ball to get under control even as Sudbury look to push up out of their area, Acle win the ball back push it out to Wells over on the right from a higher position sends the ball back into the box far post area again, Burton turns and spinning back in gets her foot over the ball and scores her 2nd of the match 2-3. Dade comes off for Acle with Pasque coming back on. Sudbury press forwards looking to get back into the match a powerful run on the right wing from Etheridge getting down the line squares the ball into the middle, running back the ball strikes the 1st defender inside the box, taking alot of pace of the ball deflects through to Teager beyond running onto the ball strikes it 1st time drills the shot wide. Glendinning tries her luck from distance running with the ball before pulling the trigger 25 yards out, the ball bouncing through into Everett. A double change for Sudbury with Jeffery and Turner returning to the action replacing Lindon and Roach. Partridge lines up a shot from 35 yards out a powerful drive is blocked by McGuire on the edge of her area. Players are tiring on both sides as the game moves into the final stages. GOAL! Wells is in space some 30 yards or so out from goal as the ball is rolled into her, has time and space to line up a shot gets plenty of pace behind the ball as she fires it across the diving Everett into the back of the net to score her 2nd goal of the game and put Acle 4-2 up. Acle get the ball up into Burton, Pasque looks to get ahead of everyone gt into the box to receive the pass, Burton tries to play her in Everett coming out can get hold of the ball 1st set up a counter attack the ball up the field quickly played into Etheridge bursting clear to attack the Acle box shoots from outside the area as she sees Hooper rushing out to close her down fires a fierce shot past the keeper across the area, strikes the base of the far post cannoning back out across the six yard box, the Acle defence are 1st to it launch the ball clear. Into added time, Sudbury push players on looking to put the Acle back line under pressure Partridge gets the ball in behind with Teager running onto it clear of the defence taking it to the edge of the box Hooper is charging out to meet her sliding in Teager shoots, Hooper gets something on the ball takes the sting out of the shot as it gets past her by then her defence has got back round on the cover to clear the ball as the referee blows the final whistle. My thanks to both sides for their help with the team details today, best of luck to both for the rest of the season. 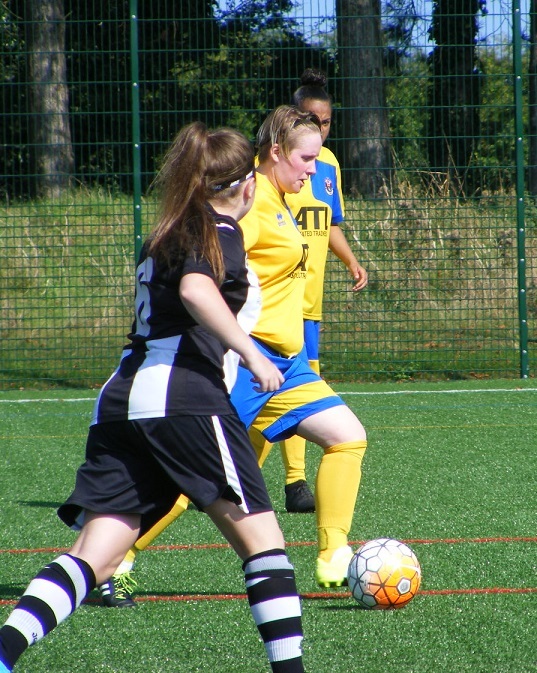 This entry was posted in ERWFL Premier Division, Match Reports, SWF Blog and tagged Acle United Ladies, AFC Sudbury Ladies, ERWFL Premier Division, Match Report on August 28, 2016 by WFEast. 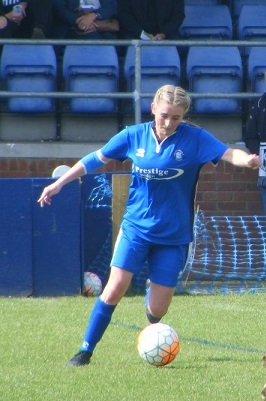 This entry was posted in ERWFL Premier Division, Match Reports and tagged Acle United Ladies, Billericay Town Ladies, ERWFL Premier Division, Match Report on January 5, 2016 by WFEast.